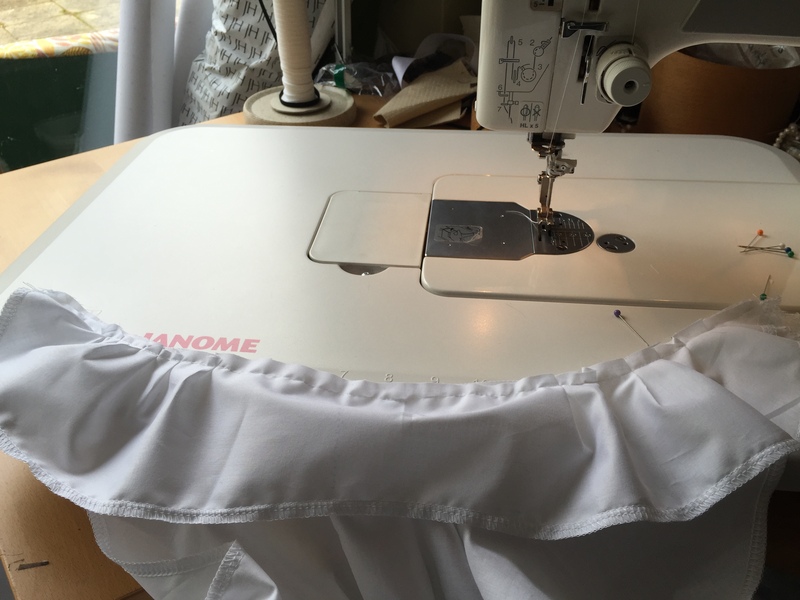 Since our next Victorian Ball has a Crinoline theme, I have promised a few tutorials and pattern reviews for the folks who are making their own kit. 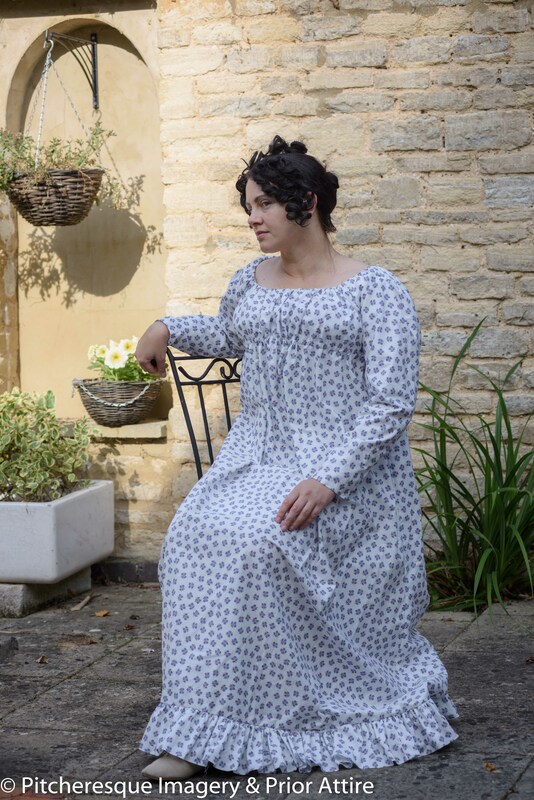 Sew Curvy joined the fun and now offers very attractively priced patterns and crinoline kits from the era ( just a few left in stock…), so I took advantage of the offer and grabbed a few patterns too. 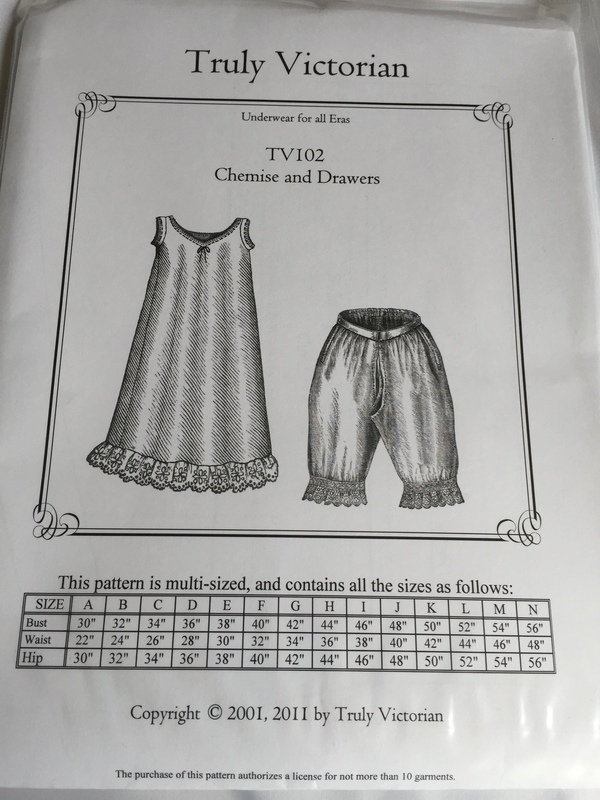 Normally I don’t bother with commercial patterns much, underwear included as I draft my own, and for Victorian Era the patterns in Francis Grimble’s books are of a great help – so this was a bit of an adventure, trying to actually follow instructions. 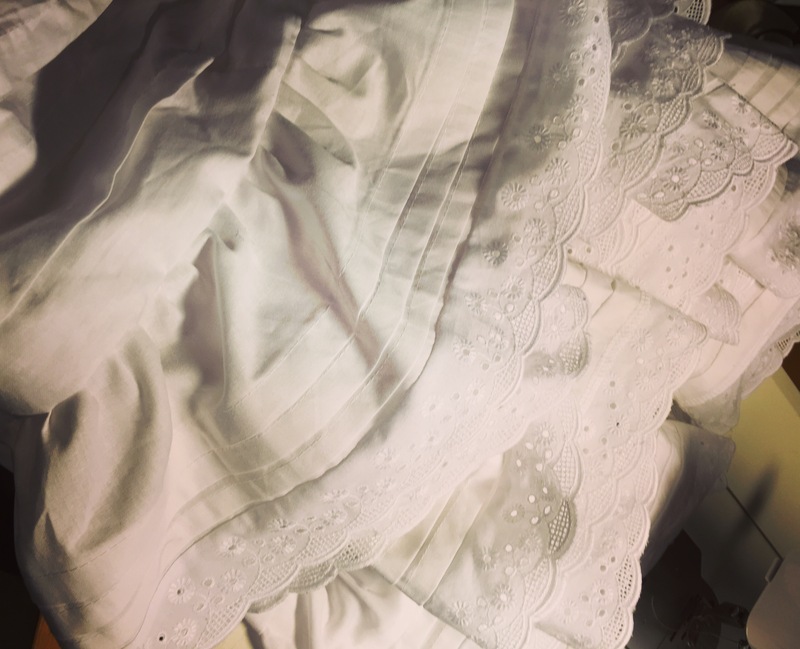 Which I did, to some extent… 😉 And so, below, a short tutorial on making a set of mid-victorian open drawers, a chemise and a petticoat. 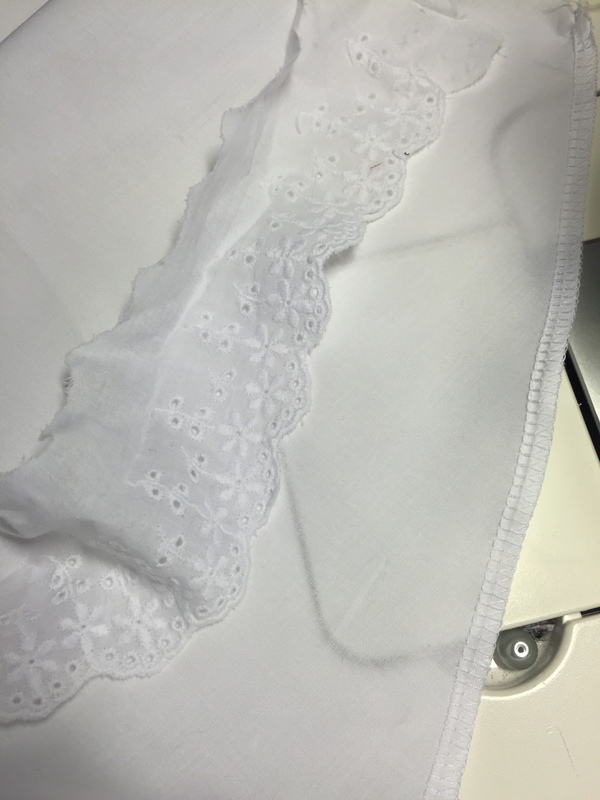 Fabrics: cotton lawn (but any lightweight cotton or linen will do) and cotton lace, 3 buttons. 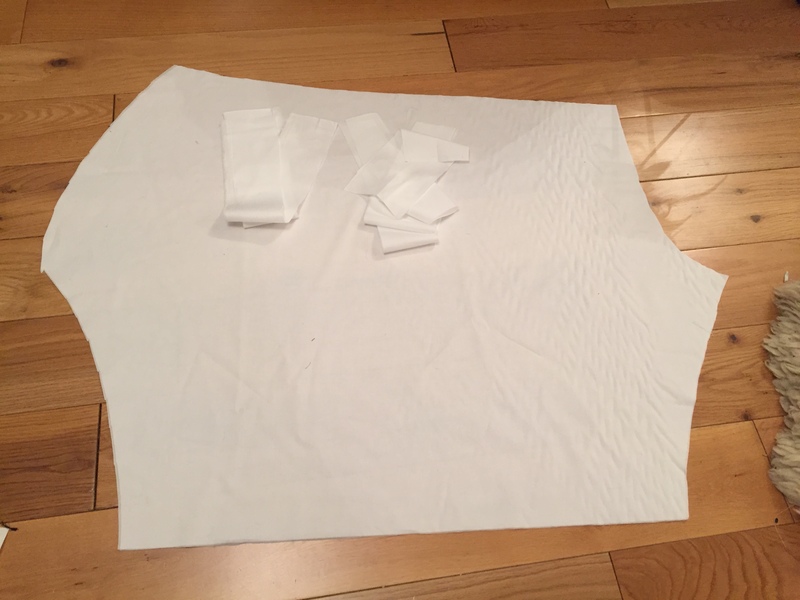 1. find your size on the chart, trace the pattern. I traced it onto paper once, so that I dont have to cut the pattern itself. 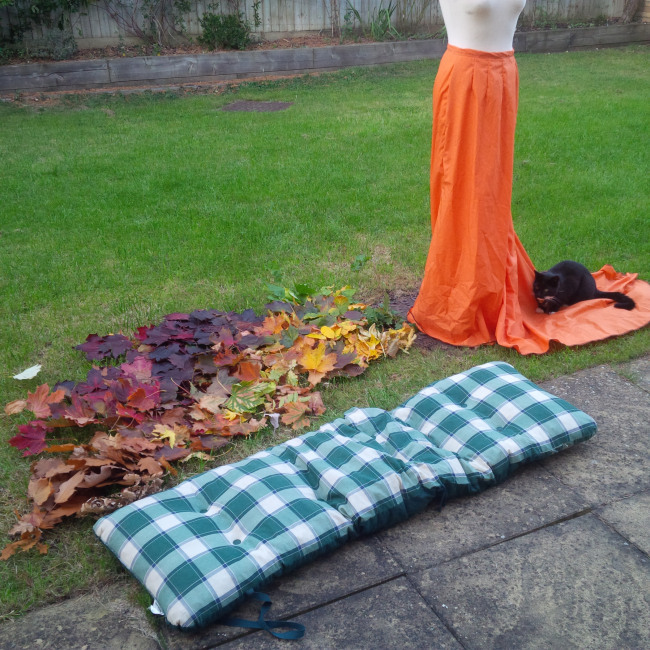 2. trace the pattern onto the fabric – fold the lawn in half and you will only have to cut once! 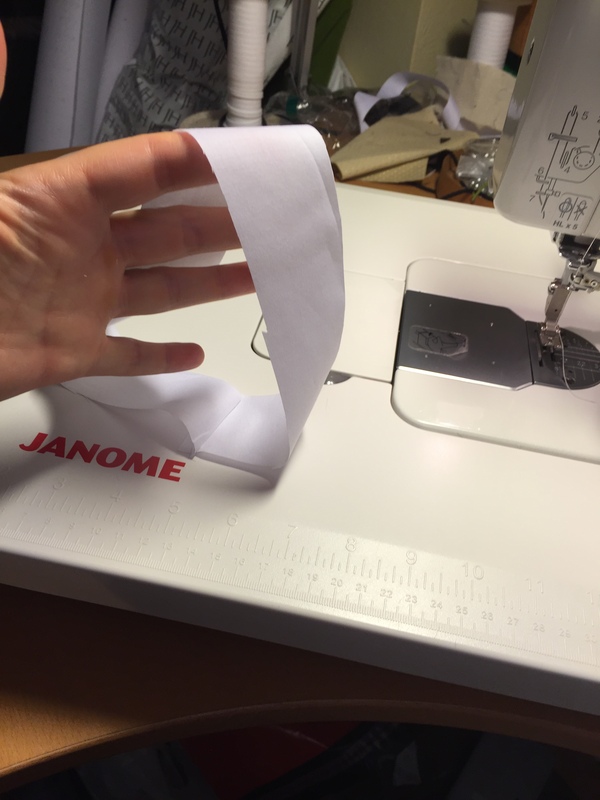 3. once cut, I overlocked the side seams and the facing for the size. 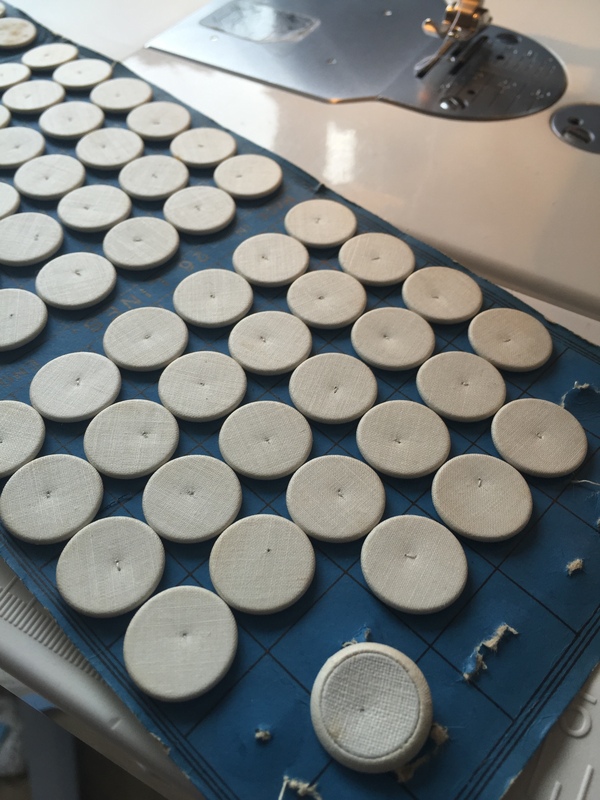 I decided to save time and forego front and back facings – not really needed, though they would give a nicer finish! 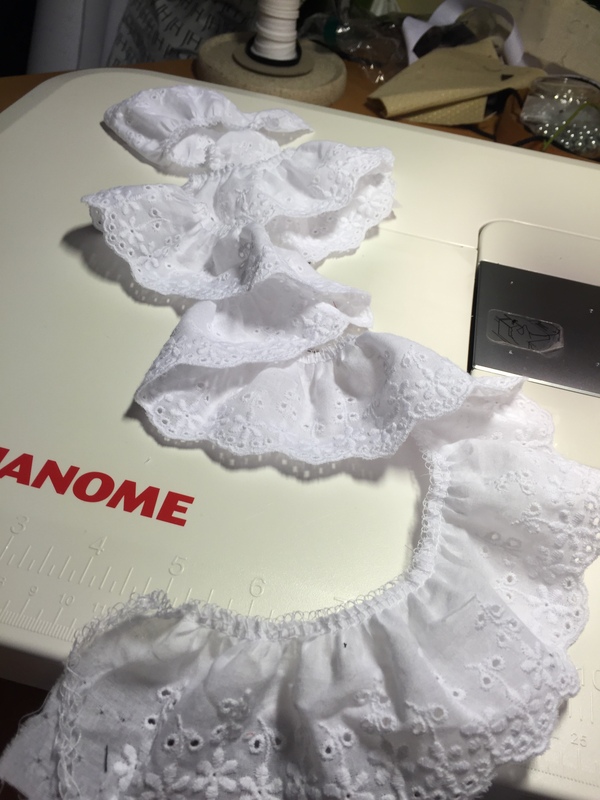 Instead of a self ruffle I used cotton broderie anglaise lace. 4. 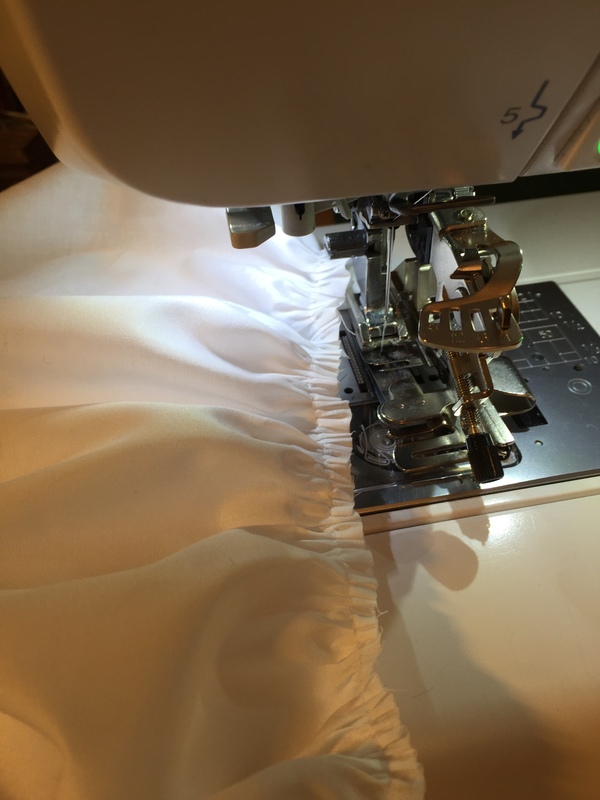 Follow the directions for working the side openings/facings – they are explained fairly clrealy. Flip the facing onto the left side. Press. 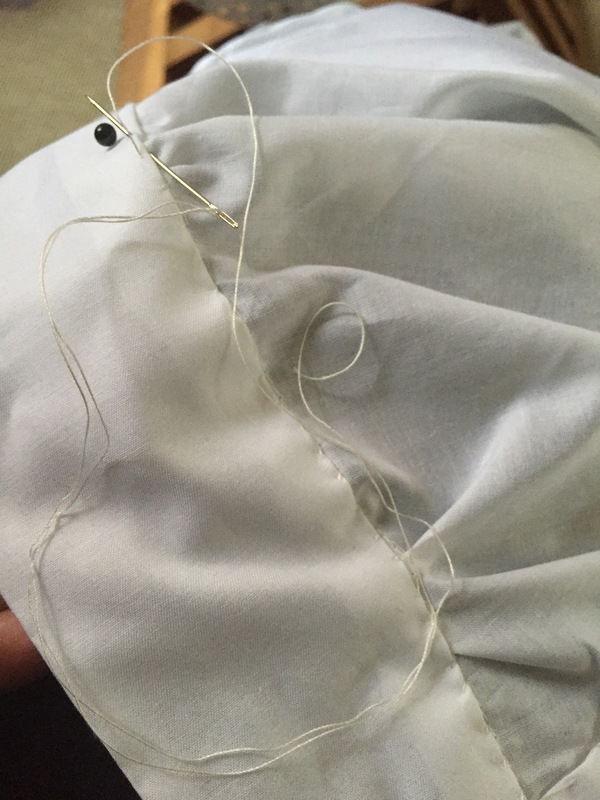 I usually run a stitch just next to the edge too. 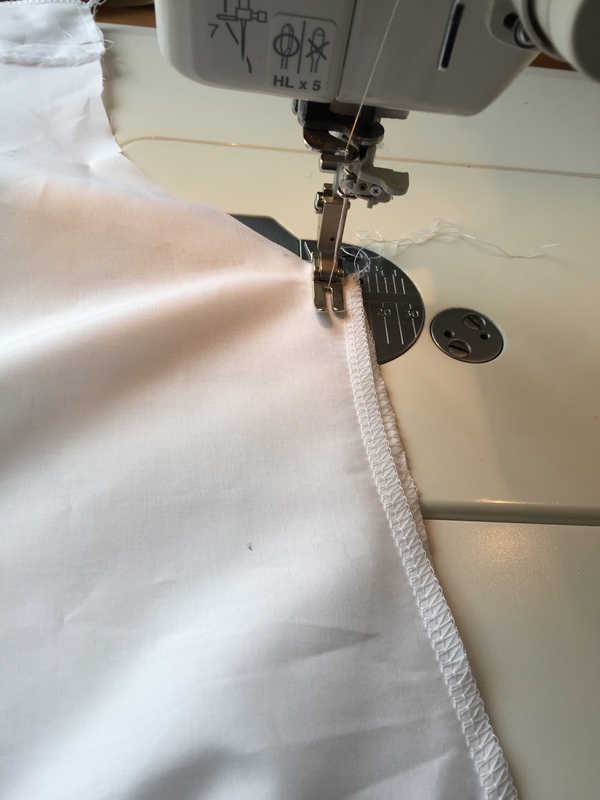 One leg done – not the gathered bits! 9. 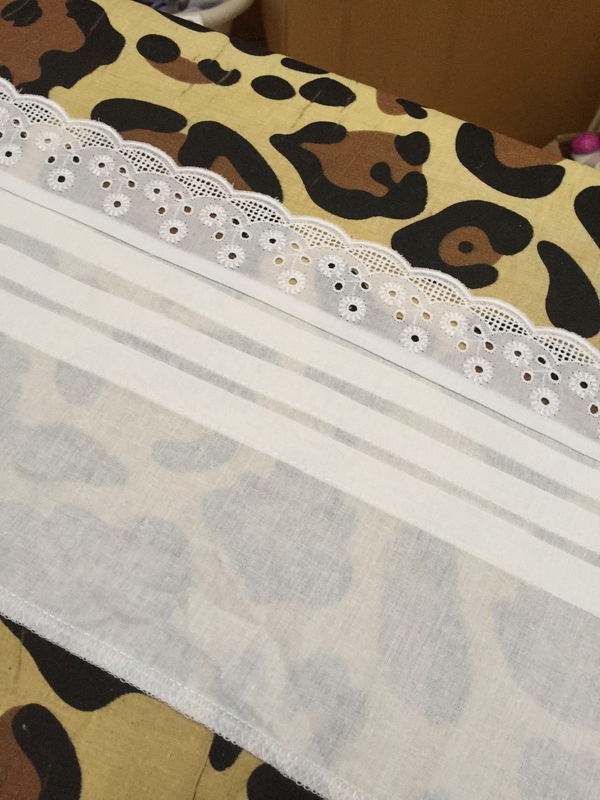 Prepare the leg bands and attach lace to them – the instructions are quite clear about how to do it. 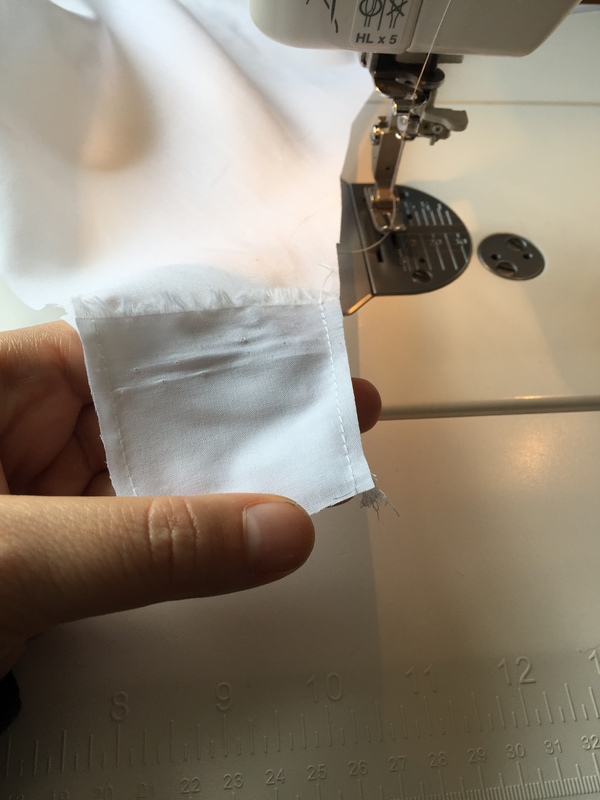 Fold and pin the inside band; hand stitch in place. Repeat for the other leg! 10. 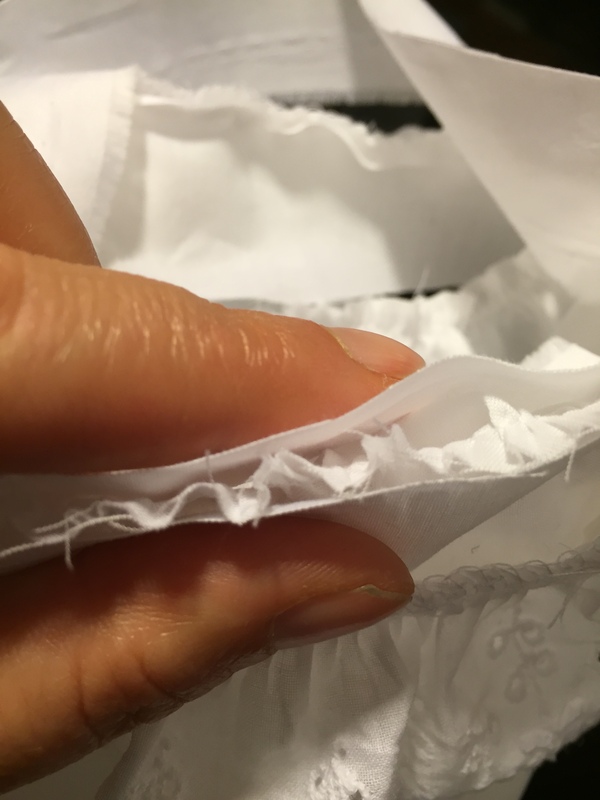 Attach the waistbands – again, the instructions are clear! Ready! 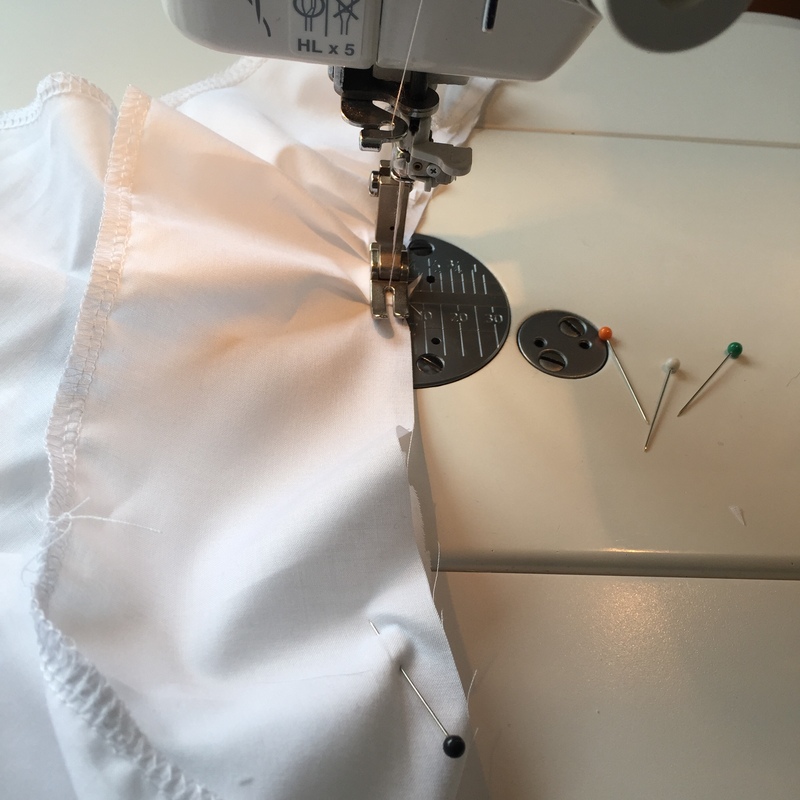 it took me just over 2 hours to complete the project – it would be about 3 – 4 if I wasn’t using an overlocker. 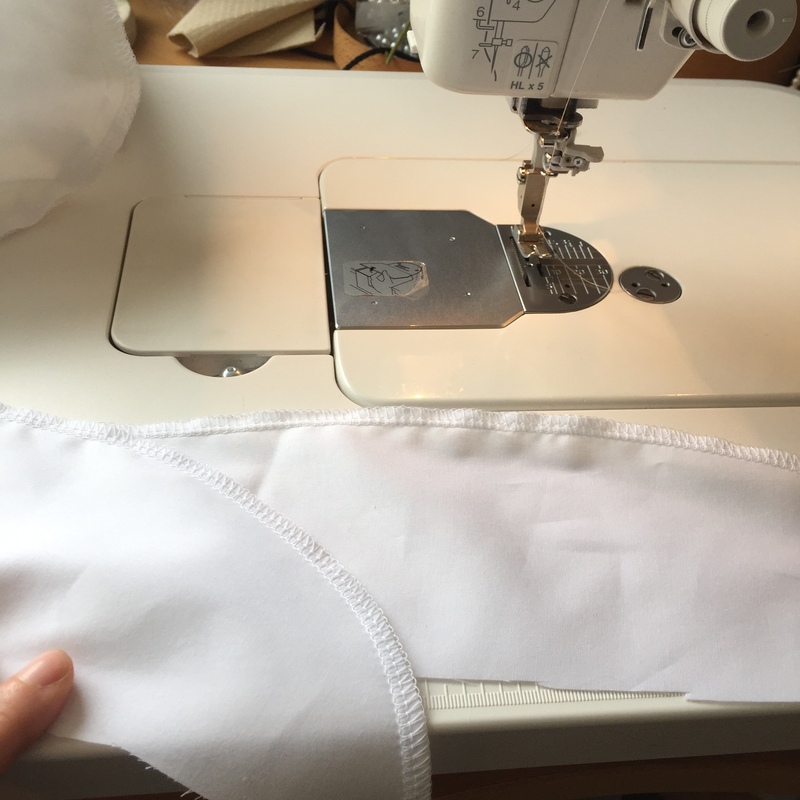 I found them just a bit too big at the waist – if I make them again, I will choose the waistband one size smaller. Apart from that tiny detail, the pattern worked well! 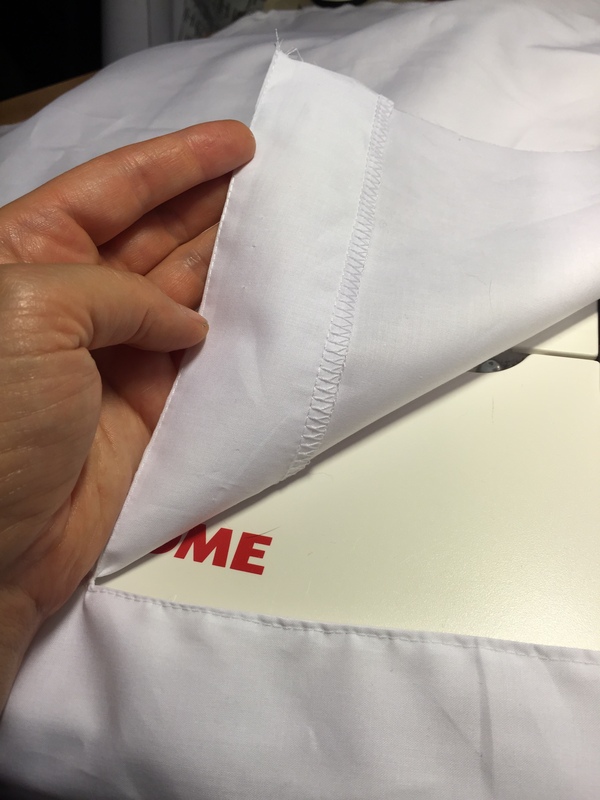 4.Overlock the sleeve (or hand finish) and attach to the armhole. 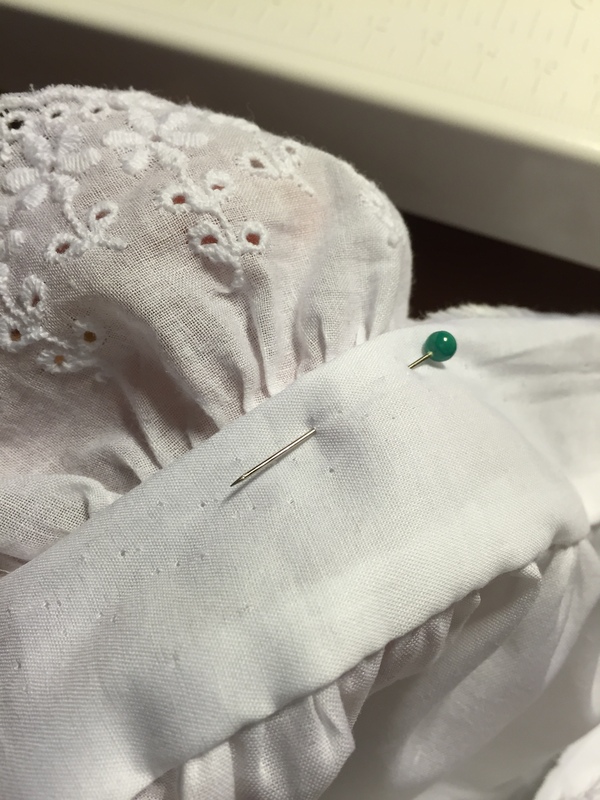 You will need to gather a bit; I did it as I sewed. 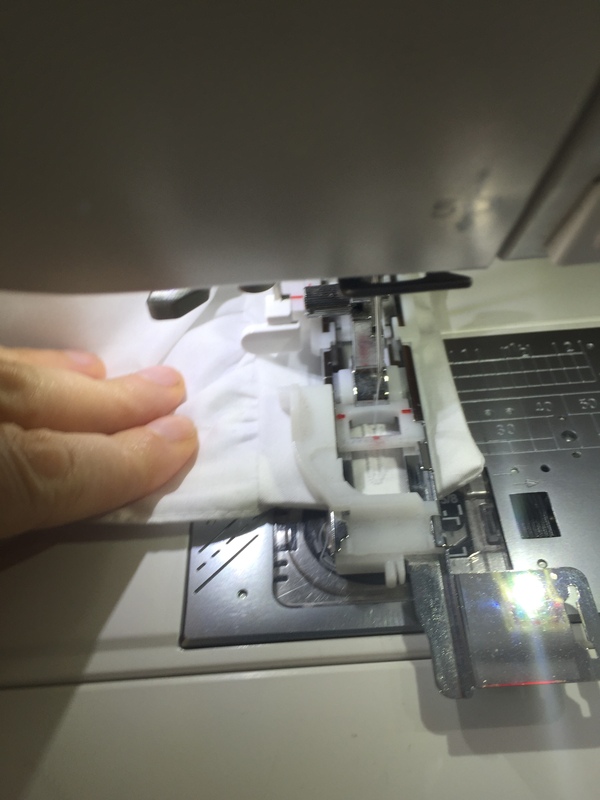 …and the seam gets overlocked ! 6. 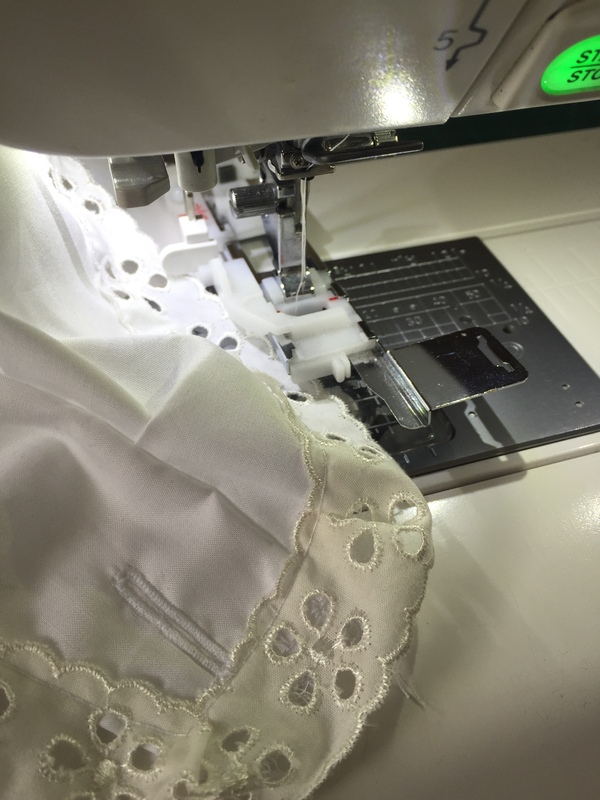 Add lace – I used a narrow broderie anglaise, as I had enough to use on the sleeves, neck and hem! 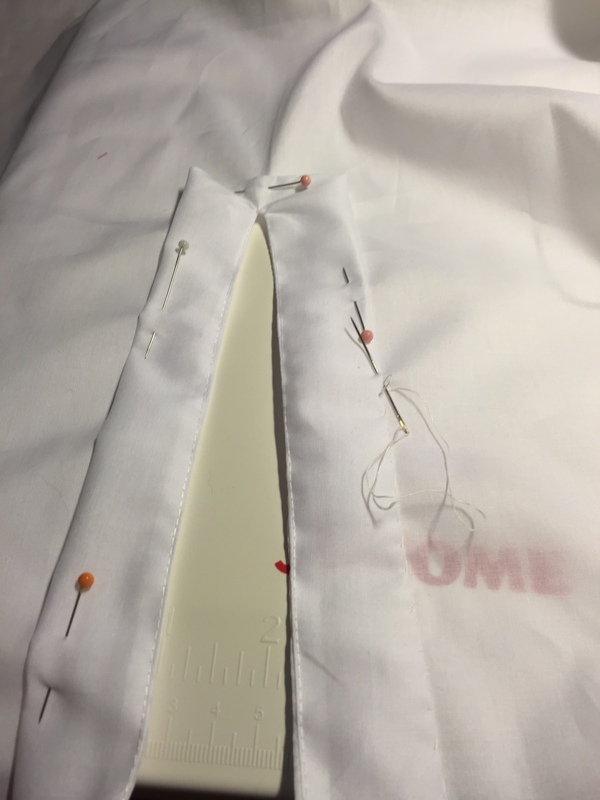 The chemise is now ready! 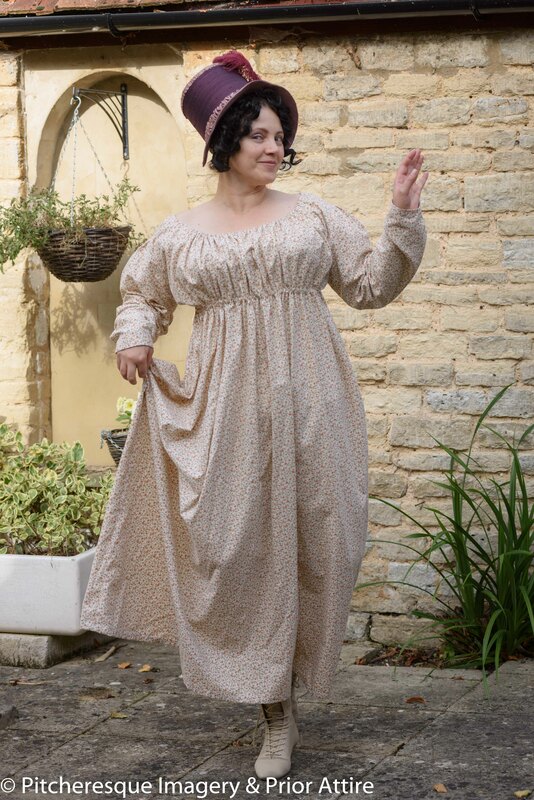 I have also made another version of the chemise, too – the same pattern, just with no sleeves, and no buttoned-up staps – I simply sewed the straps together instead. 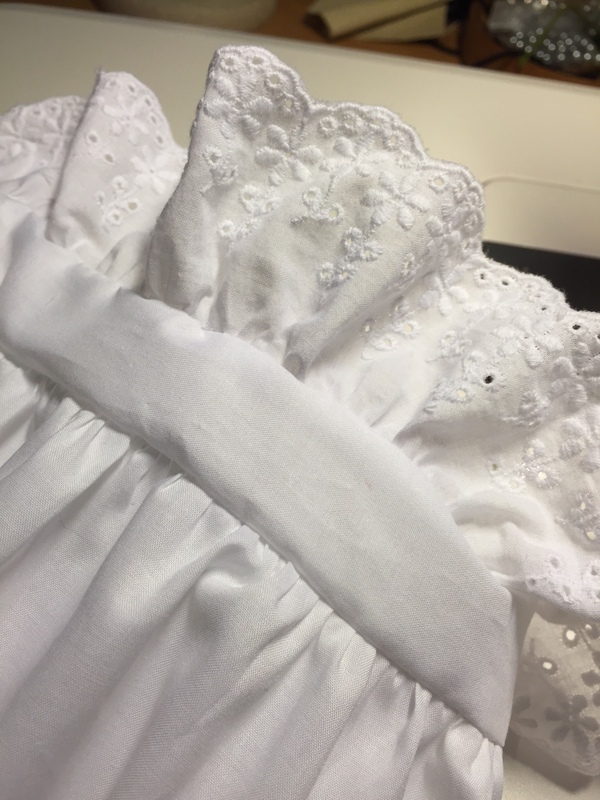 The neckline is finished with an eyelet lace with the ribbon, which controls the neckline as it can be pulled tighter, if needs be. 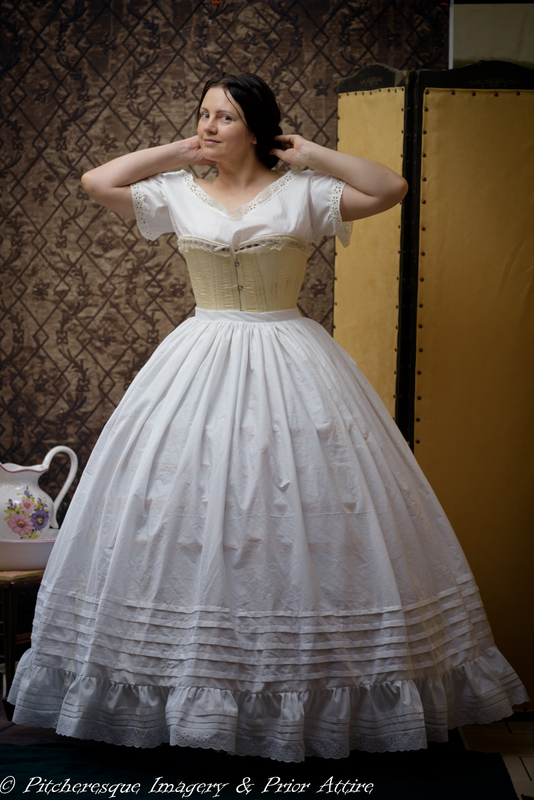 Next stage was to put one of my corsets on (a suitable corset kit can be bought here: corset kit – the pattern is later but the style works for mid-victorian silhouette and is much easier to make – I have made a mid-victorian corset using a commercial pattern and it wasn’t exactly a success – you can read about it here). 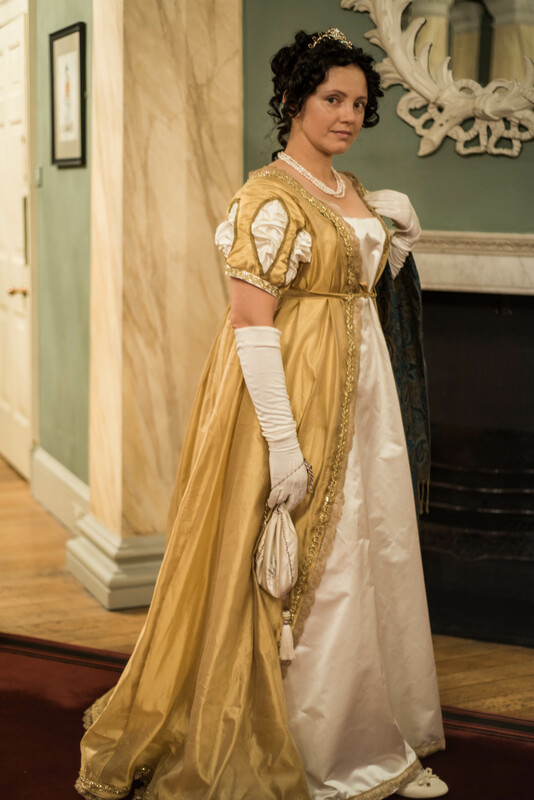 All we need now is a petticoat. 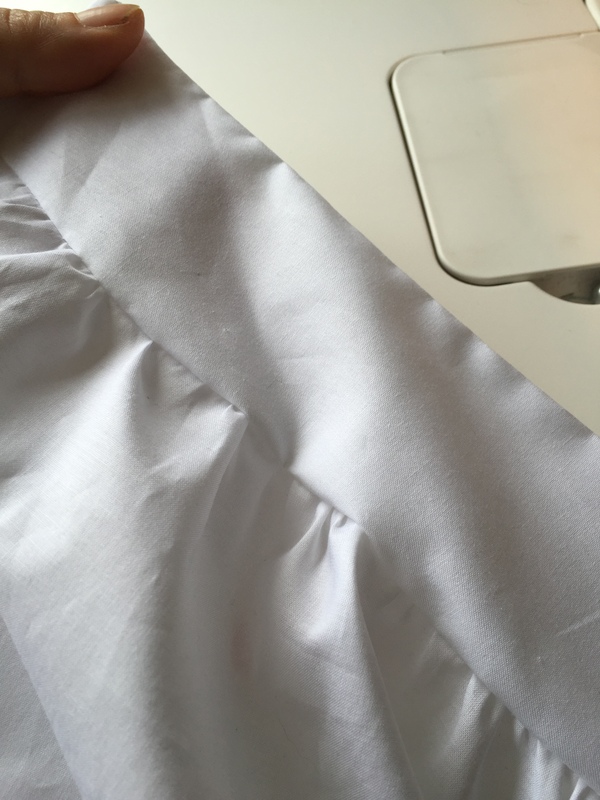 I basically used a length of cotton sheeting – a rectangular piece. 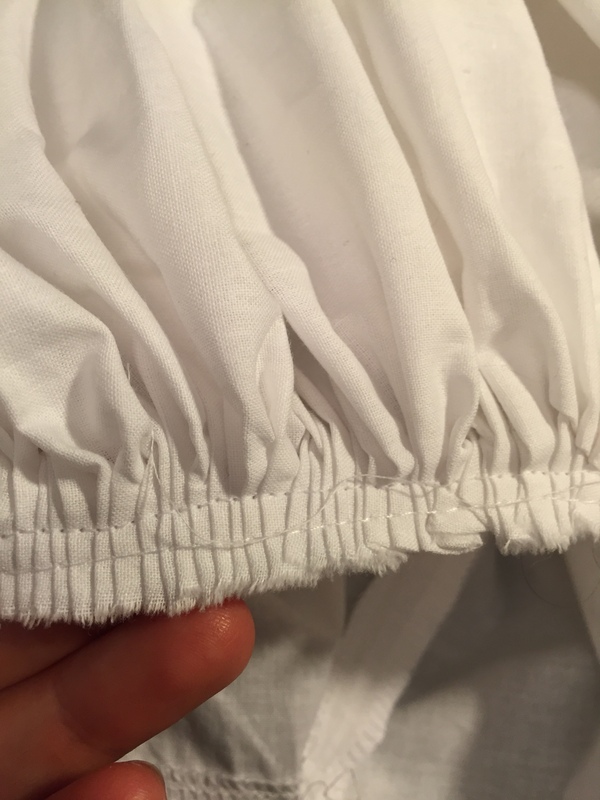 The length was the circumference of the crinoline cage plus 1m, the lengh – measured on the crinoline, from waist to the ground. 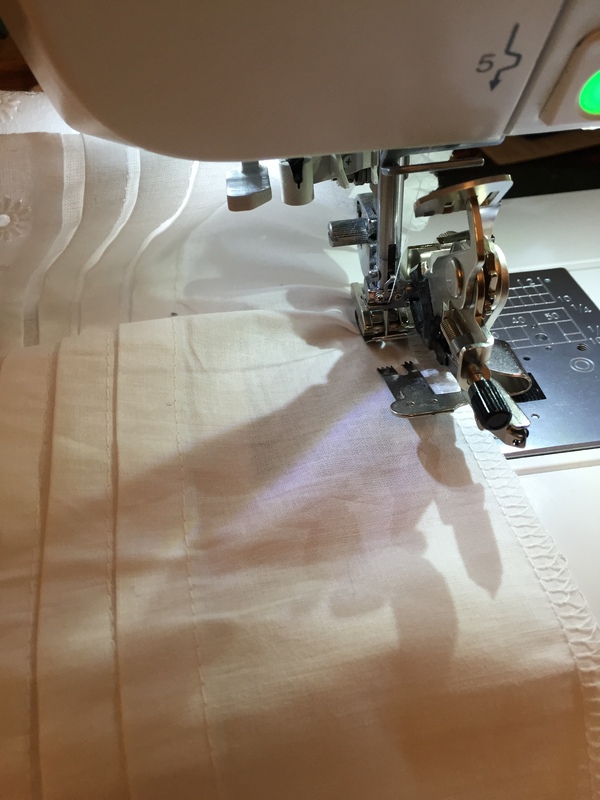 If you do not plan flounces, pintucks etc, but a basic one, keep it a bit above the ground. 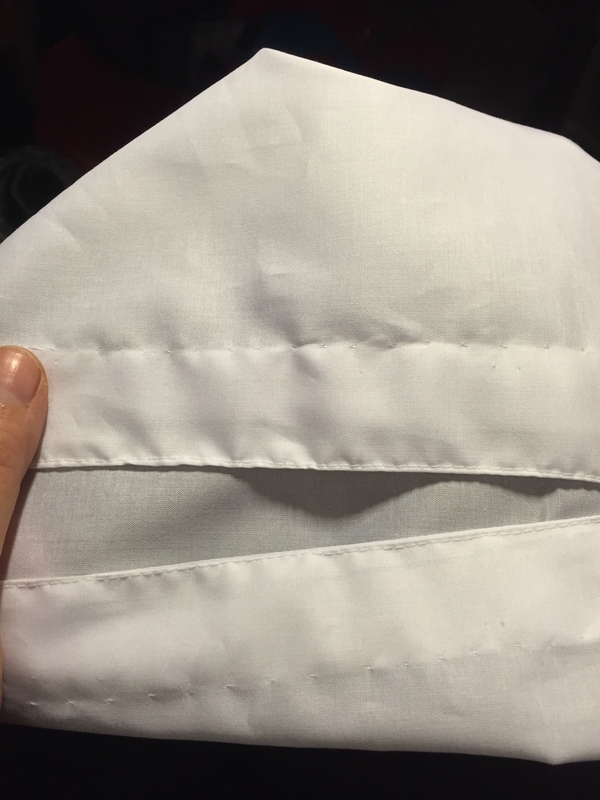 If you want lots of pintucks, make it longer. 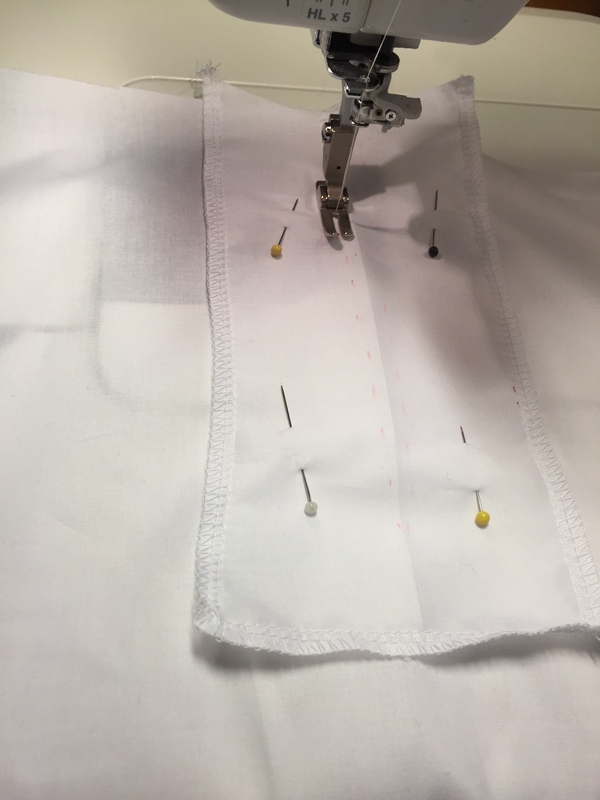 pintucks – for small, decorarice pintucks you see on chemises etc, I use a seam gauge and a pintuck foot etc – the detail is important. 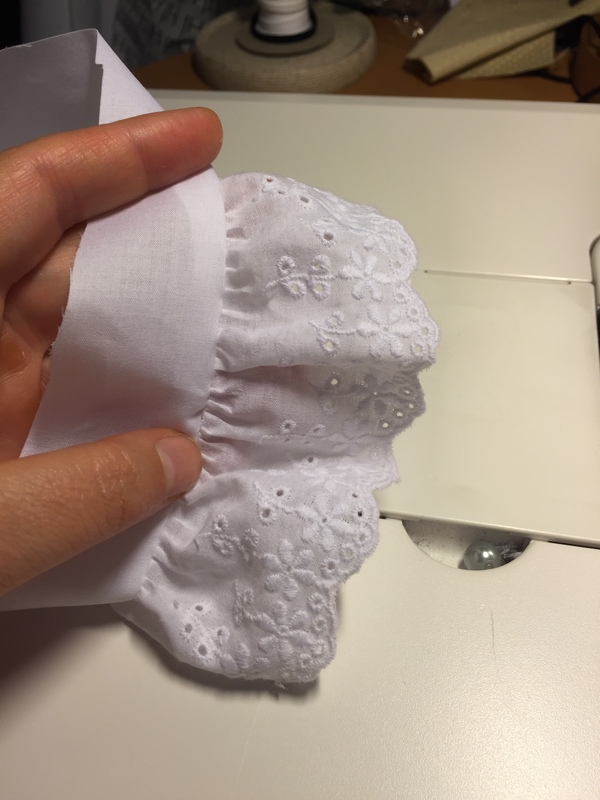 for the petticoats however, where i want my pintucks bigger, and where it doent matter too much if the pintuck is 2mm longer at one side, I save time by not marking them at all – i simply use my finger as a gauge. 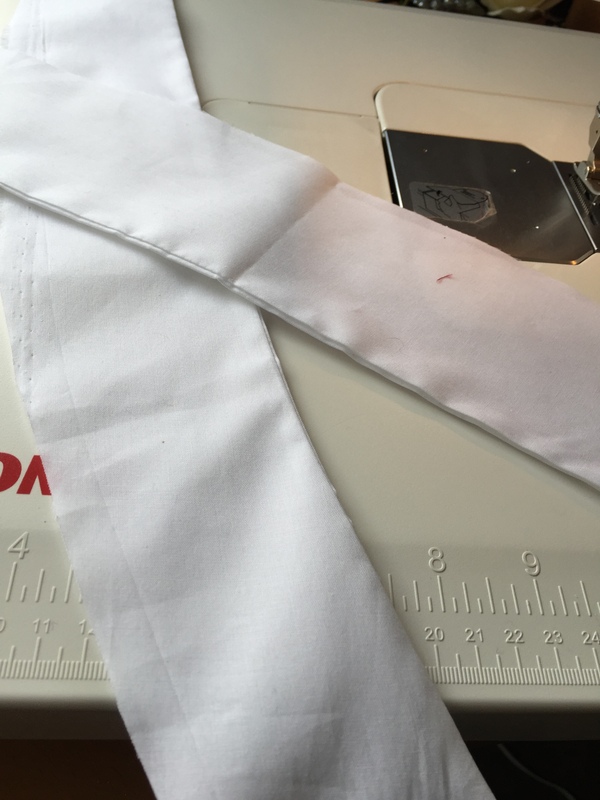 Then attach the waistband, buttons, etc, and you are done! 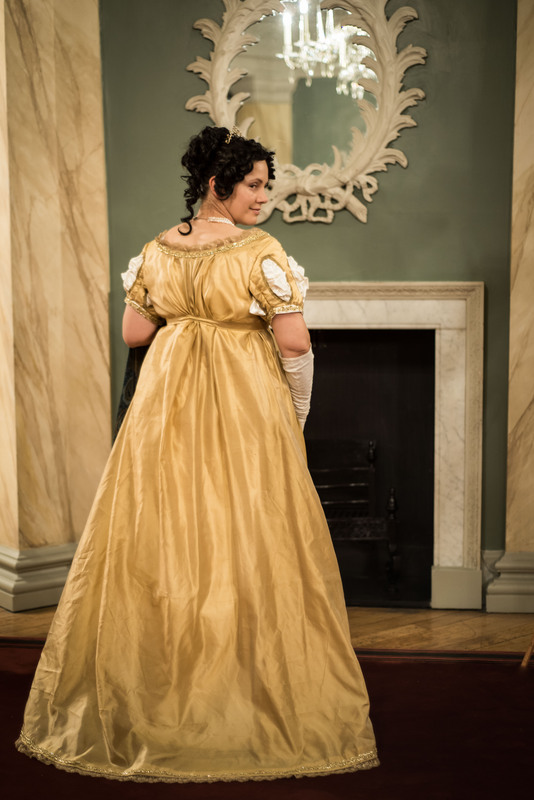 Now you are ready for a skirt and a bodice – or a gown. 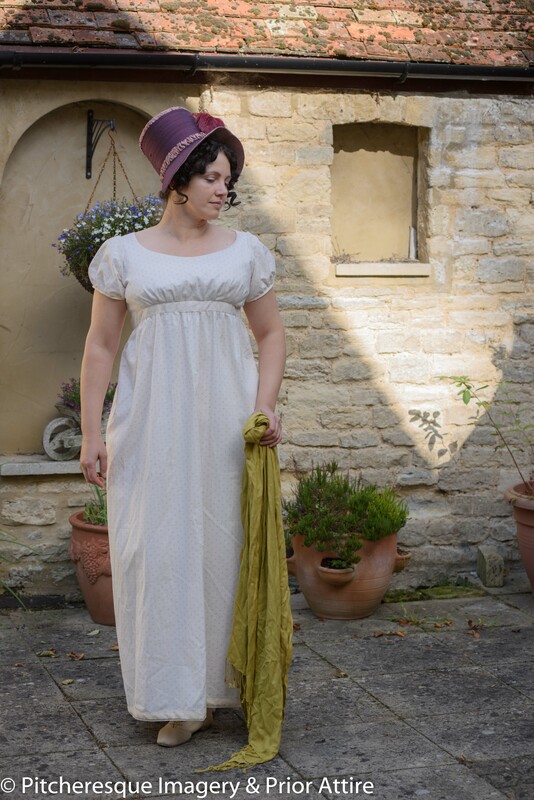 I have already written a post on a day dress – here. And a few outtakes:-) i knew the chamber put would come in useful! hmm, what do we have in here…. eughrr! Wish I hadnt looked! 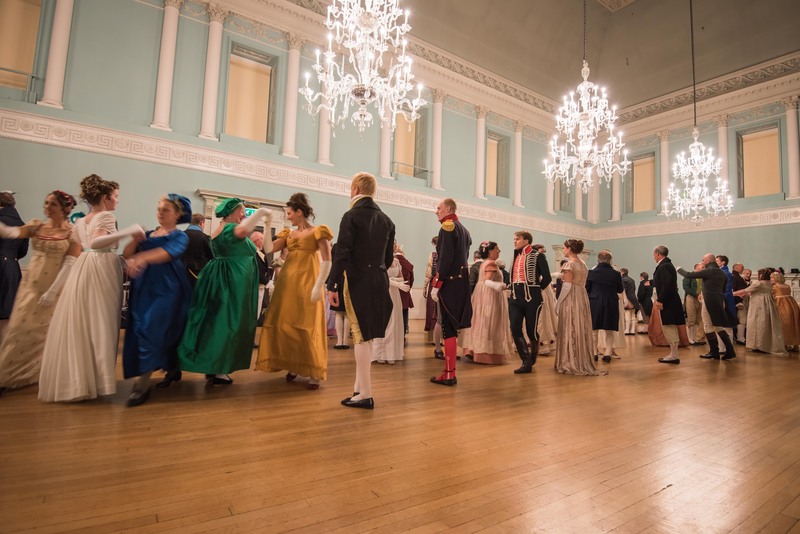 Last year we had a lovely time at out first Regency ball, part of the annual Jane Austen celebration in Bath (see post on that here). 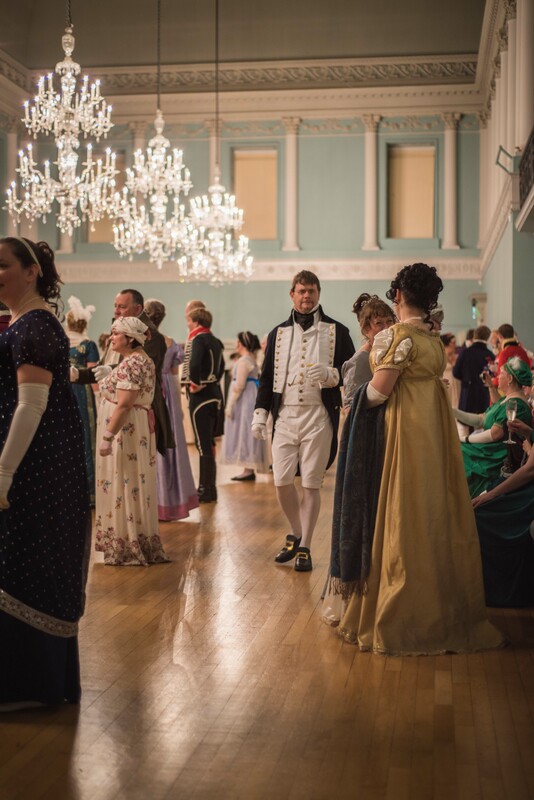 This year the dates were changed a bit, which meant that the Ball was on the first Saturday of the festival, and there was a market earlier on in the day too. 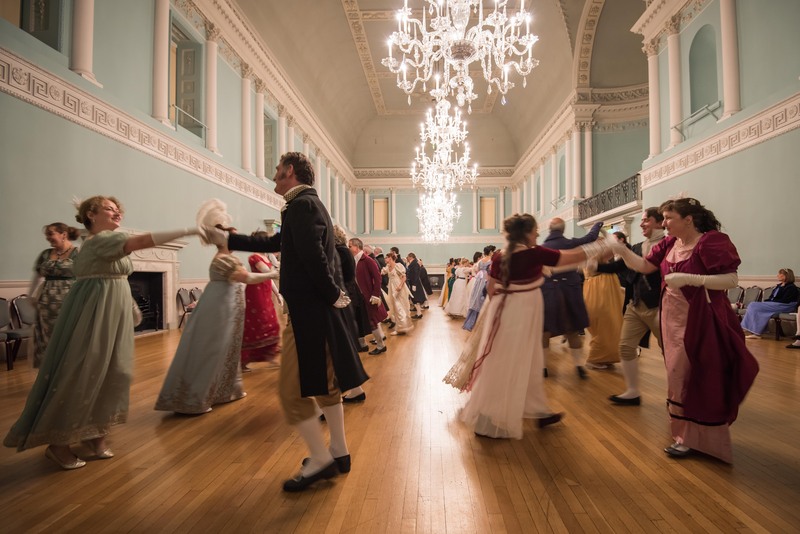 So, two birds with one stone – we could go and trade to earn our living in the day, and in the evening we could go and have a good dance at the ball! The usual dilemma ocurred – What to wear? 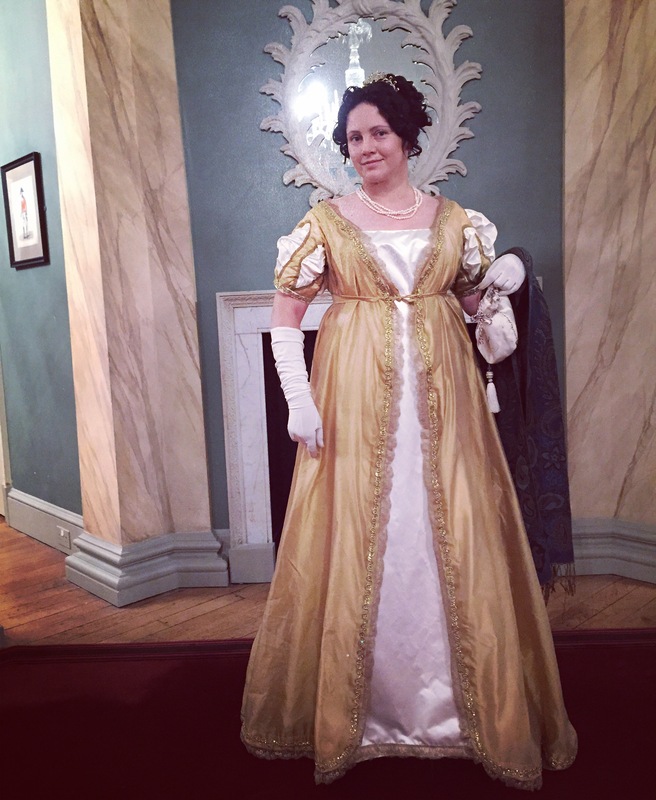 I had my old evening gown, but it would be nice to make something new. 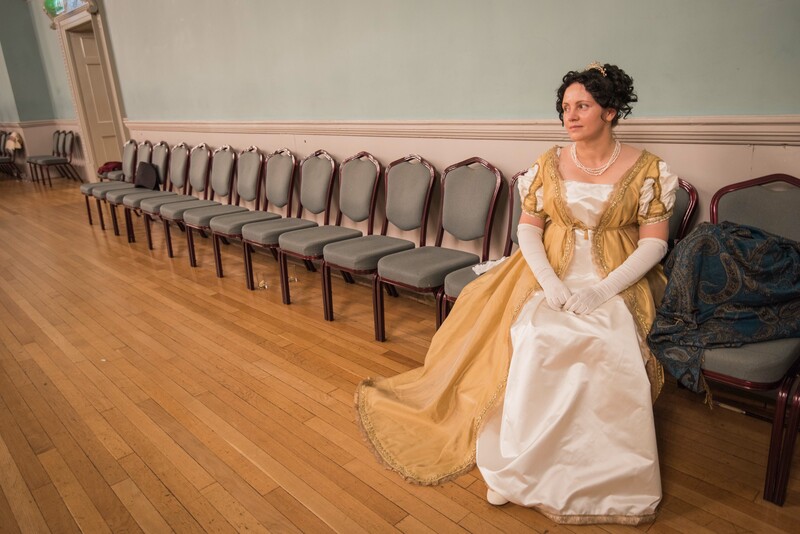 As I had only 5 days to prepare regency dresses for sale, I decided to get the stock items sorted first and to work on my own frock if I had some time spare. 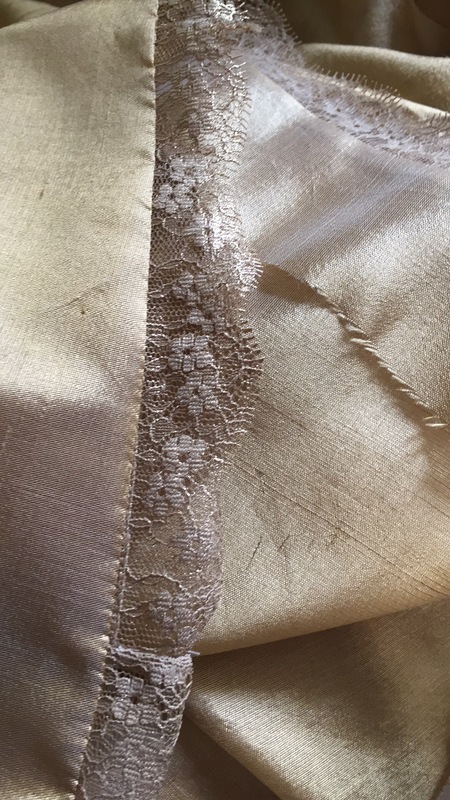 I already had some lovely gold semi-transparent silk in my stash, so all I needed to get was lace, decoration and the silk satin for the base of the dress. 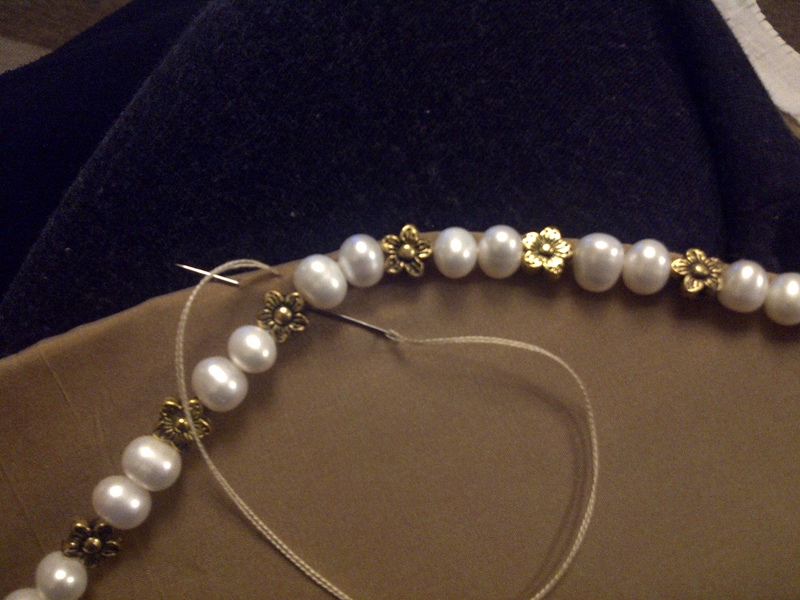 I didnt really like the pearl trim on the original, so decided on an alternative, but all of the components were ready and waiting, just in case I managed to make time for it! 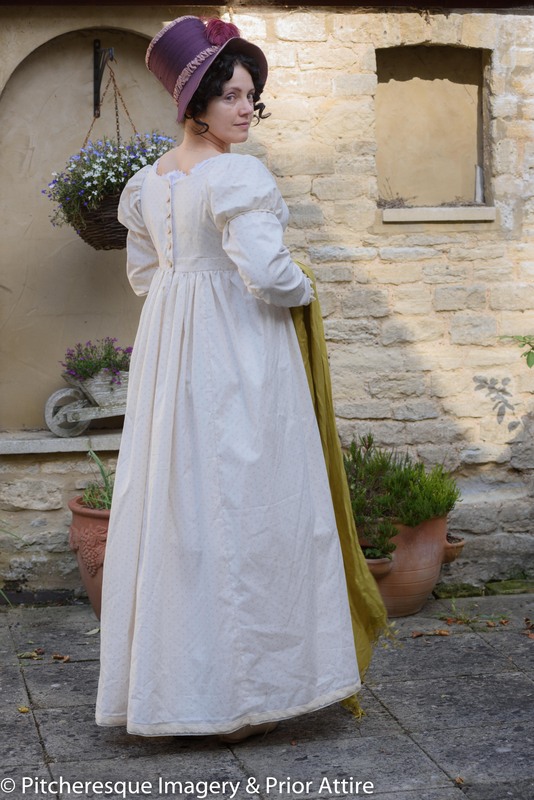 In the end I finished all the stock dresses on Friday moring – and we were to leave Friday night. I had about 8 hours. Well, you know that I do like challenges…. 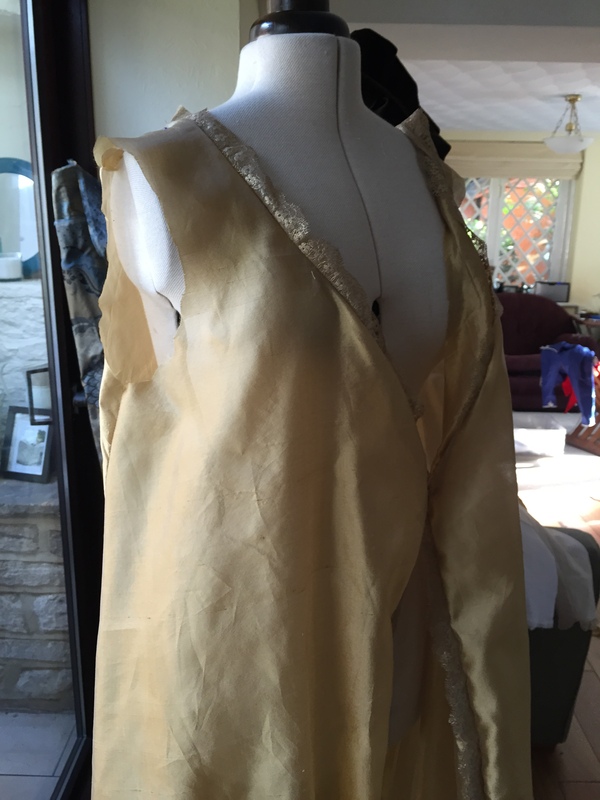 One thing has to be said – working on the stock meant that whilst handstitching other frocks I had time to think about the gold gown construction even before I started to work on it. I must admit, it did take me some time – mostly because I simply couldn’t see how it closed! 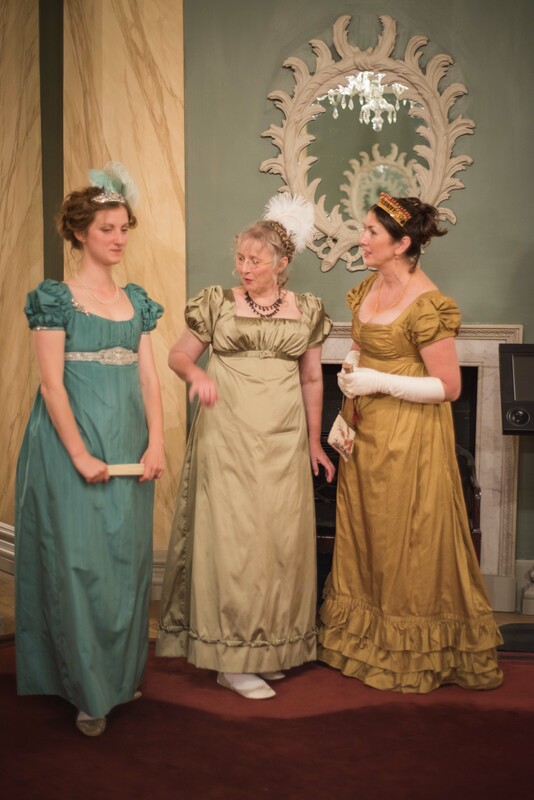 Yes, you can see the sheer overgown ties in front, but what about the satin gown? 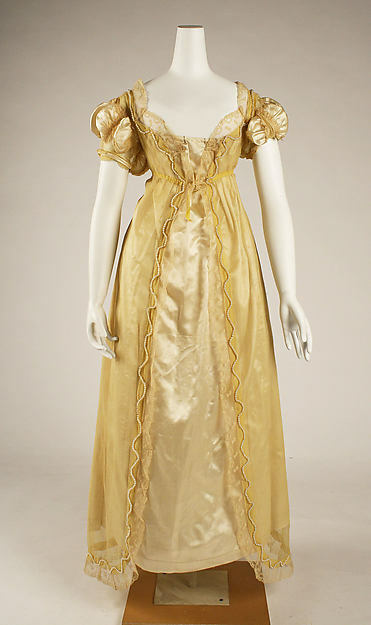 You can zoom in quite a lot on the Met site so you can see clearly that there are no rows of buttons or ties at the back under the sheer, nothing at the side or front, no button closures, no bib closure, no tie closures… A mystery! I started zooming in to maximum and checking every detail – and finally I found it! 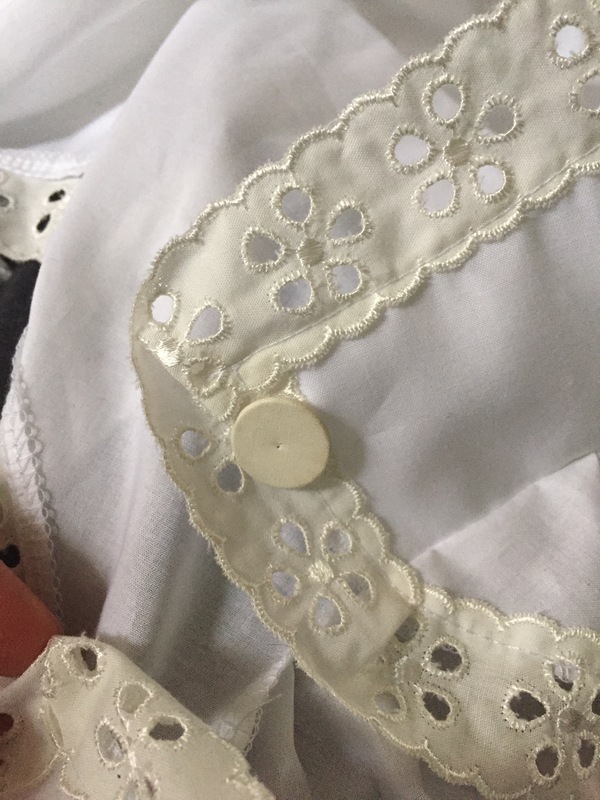 On the back, right of centre-back, you can just about see something on the satin layer that could be called a button and a loop, at the neck egde. 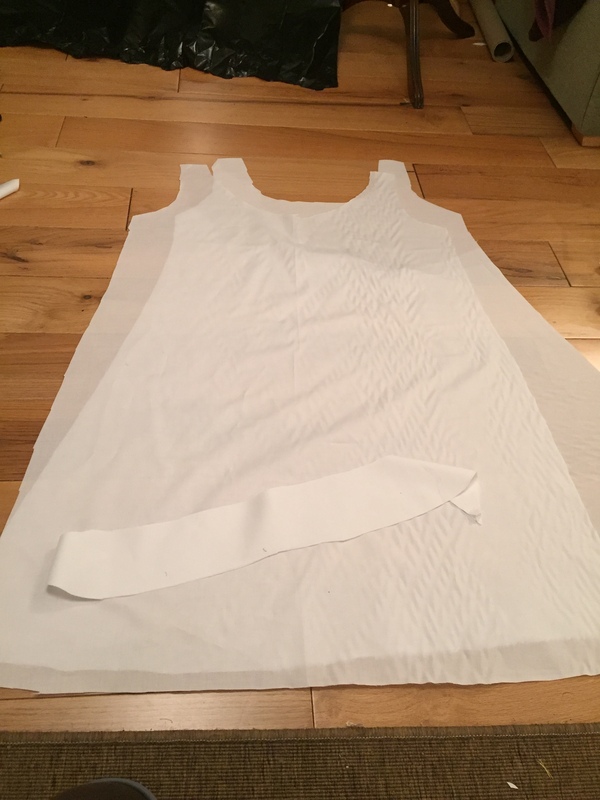 I new that must be it – After thinking a little more, and analysing the cut I arrived at a very simple pattern idea – basically a sack with fitted neckline. 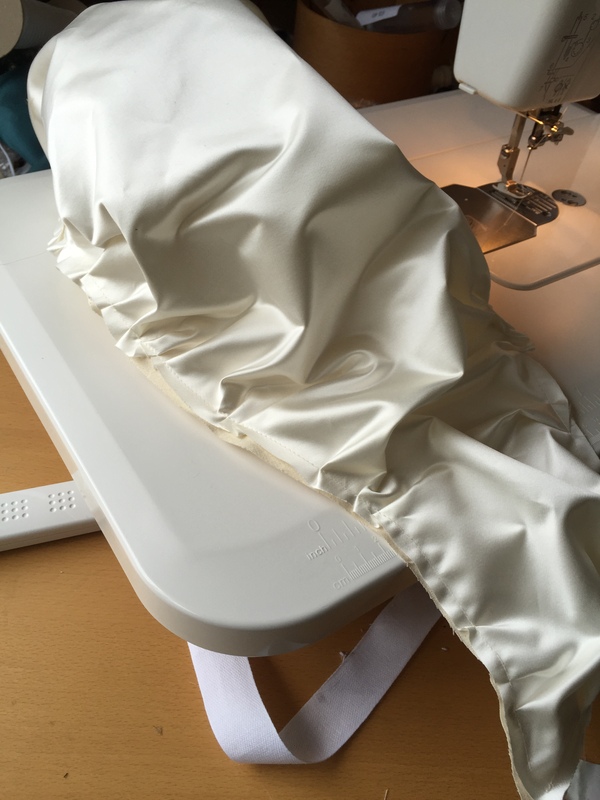 I tried the idea on a mock-up first, making the top part of the gown in calic; it worked. I actually didn’t even need the button, the thing just slips ovehead and a simple tie does the rest. 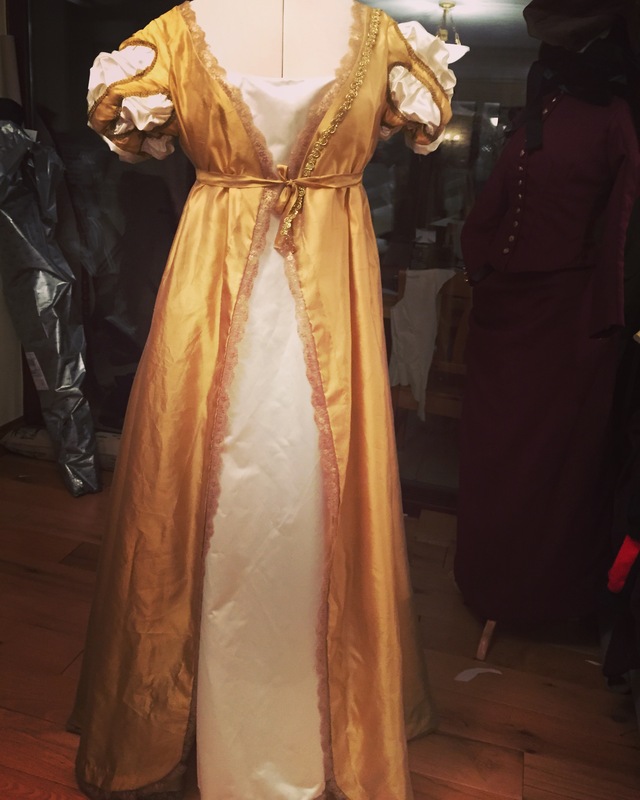 So on the day I cut the gown in silk satin, sewed it, hemmed it, lined the bodice, etc – in other words it was ready for the overgown and the sleeves. 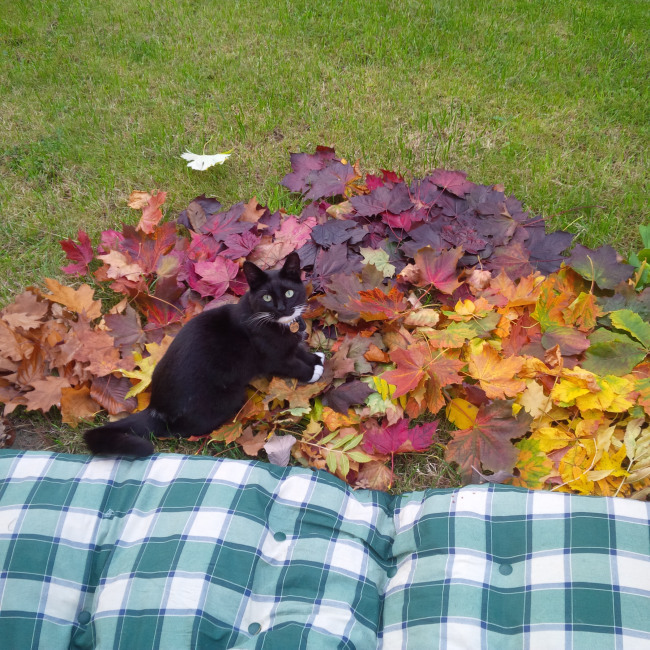 Merlin was happy as for once he was allowed on the silk. 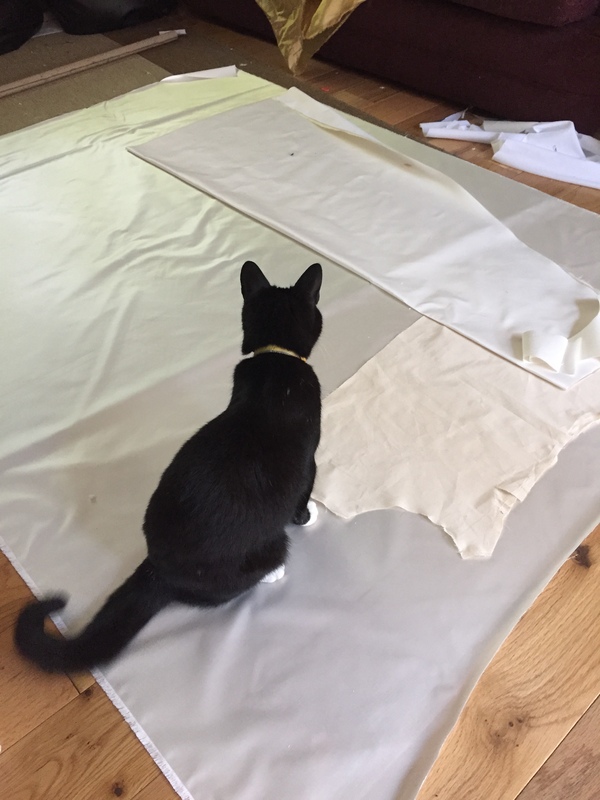 normally it is off-limits but since it was my own stuff, I did not mind – and he did enjoy overseeing the work. That was the easy part…. 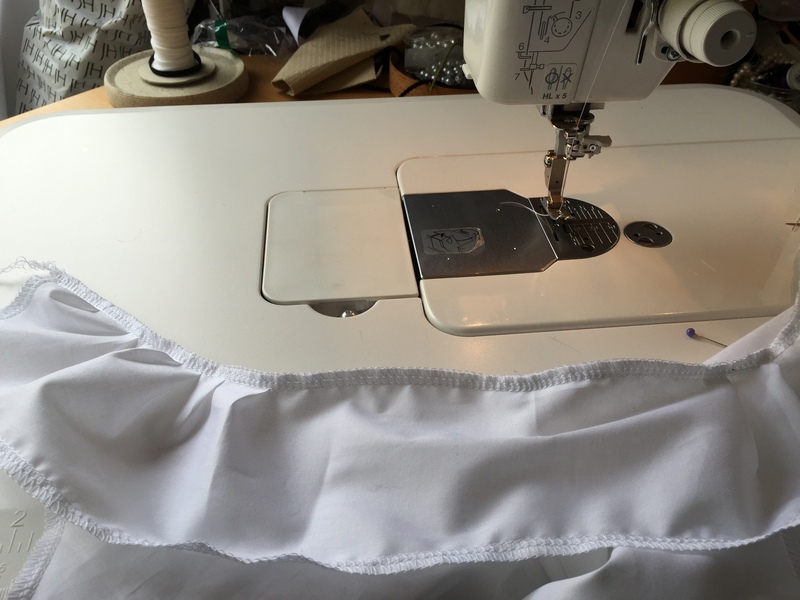 the overgown was next – and whereas it is basically a loose robe, it took the most time due to all the finishing – cutting precise facings in flimsy sheer fabric is not my idea of fun! 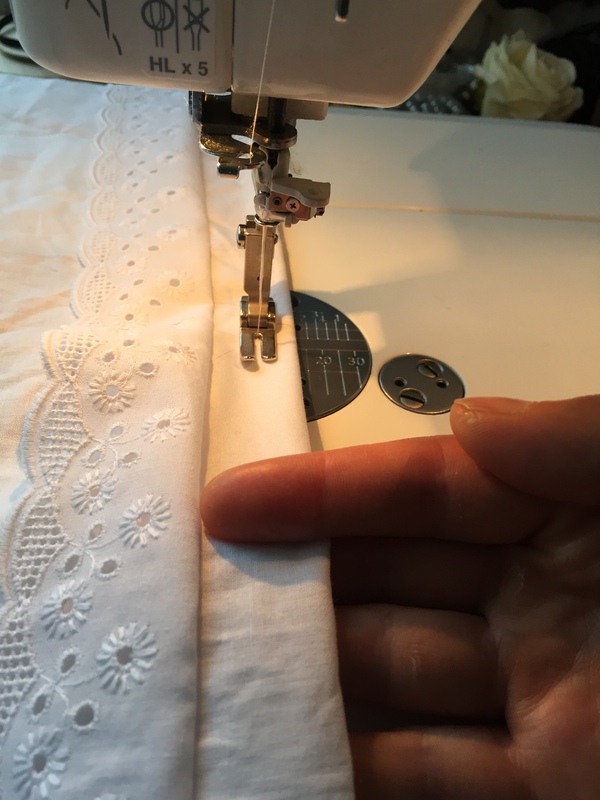 But the facings were cut, sewn, handstitched and metallic lace attached – then they were just awaiting the posh trim I wanted to use in place of the pearls. 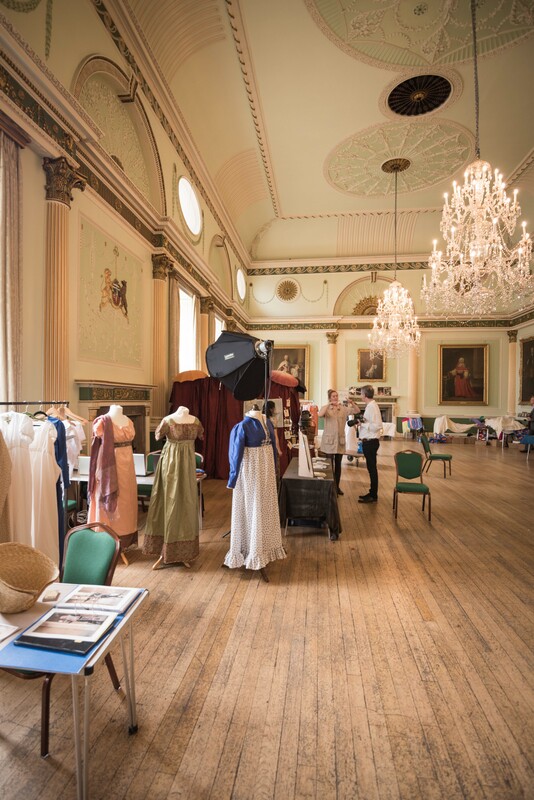 Then preparing the space for the gathering and placing the gathers in suitable places so that that they formed ‘pulling-outs’ – just as in Tudor sleeves. 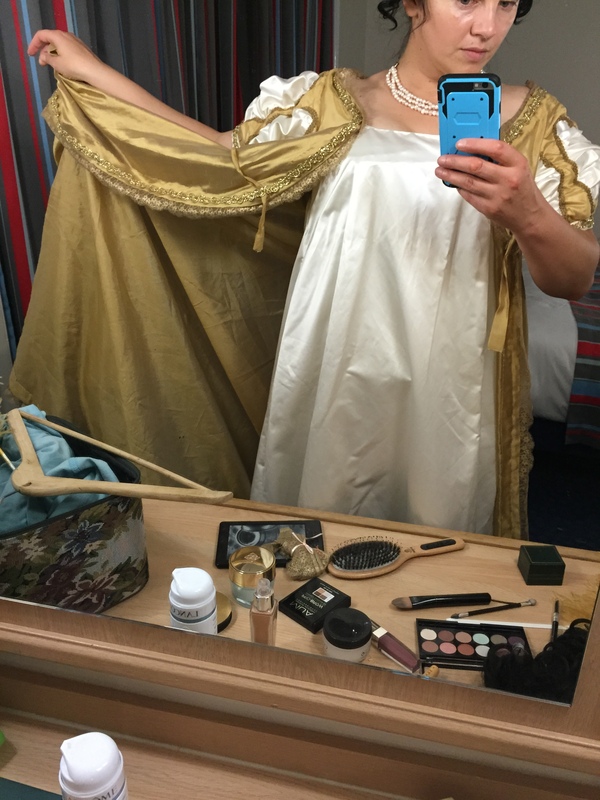 I was getting excited by this stage… All that now remained was getting the sleeves together, lining them, sewing into the armbands and then into the armhole, (both the satin and the sheer layers of the dress). 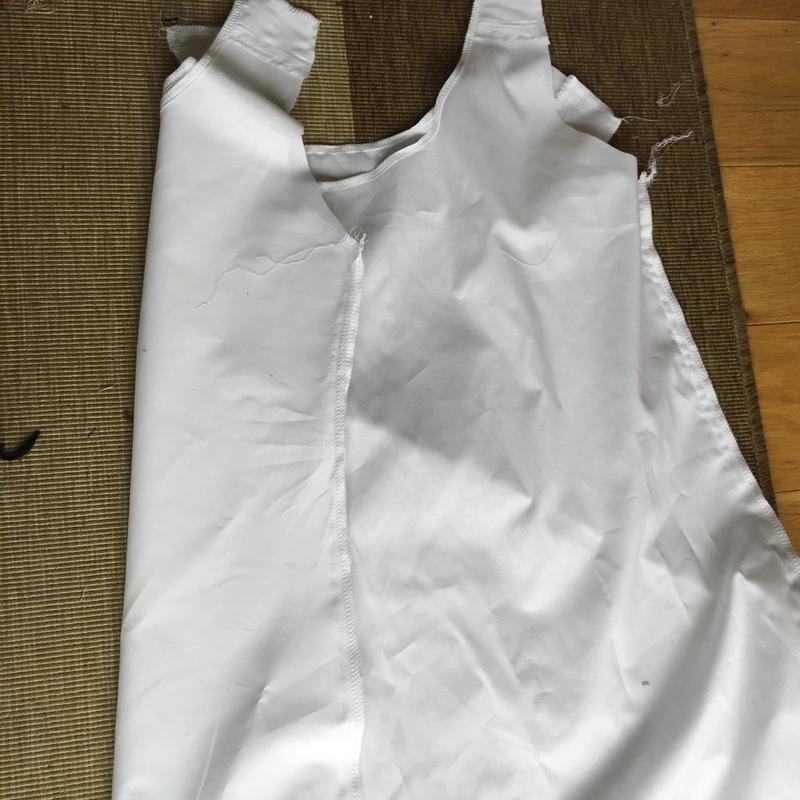 And it was almost ready – just a little belt to add, made from the sheer (I tried to attach it to pregathered sheer underneath like in the original, but after speding an hour I decided I didnt like it – so outside it went. 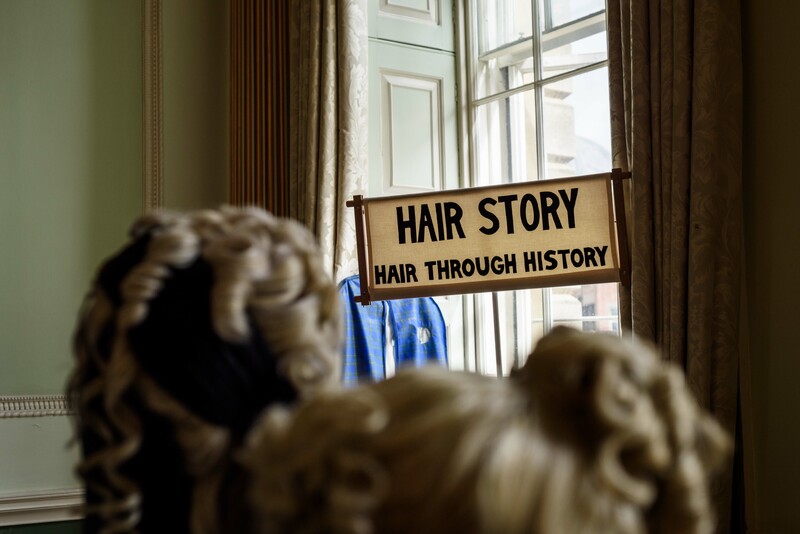 Only the posh trim remained, and that could be done before the ball next day. 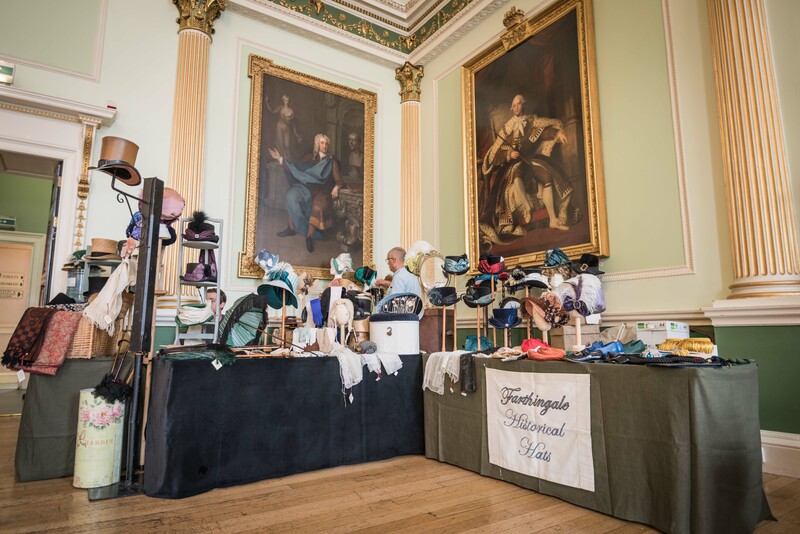 Farthingale Hats stall. 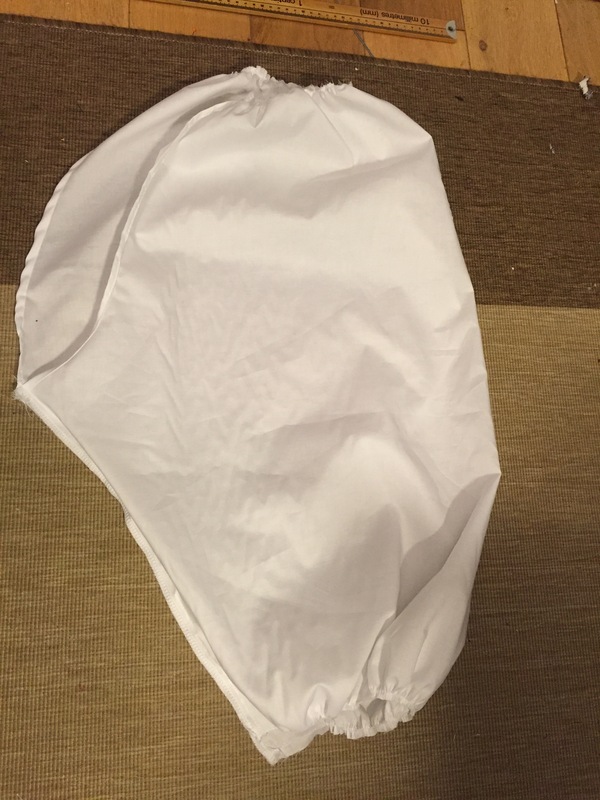 Yes, I did get a new hat…. Amy’s (Costume Shop) stand where Lucas purcahsed his replacement hose; clocked, no less! 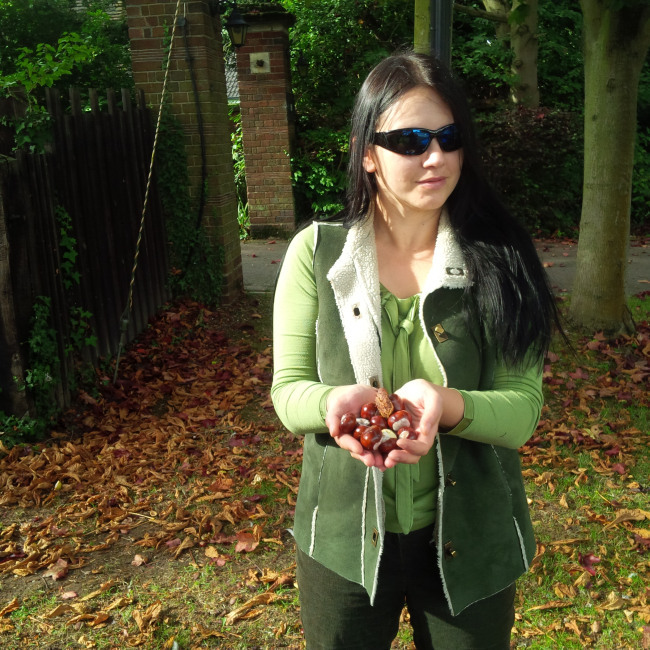 I was sporting the redingote which I made last year – more on making that here. I still love it! The silhouette cutter was super popular! 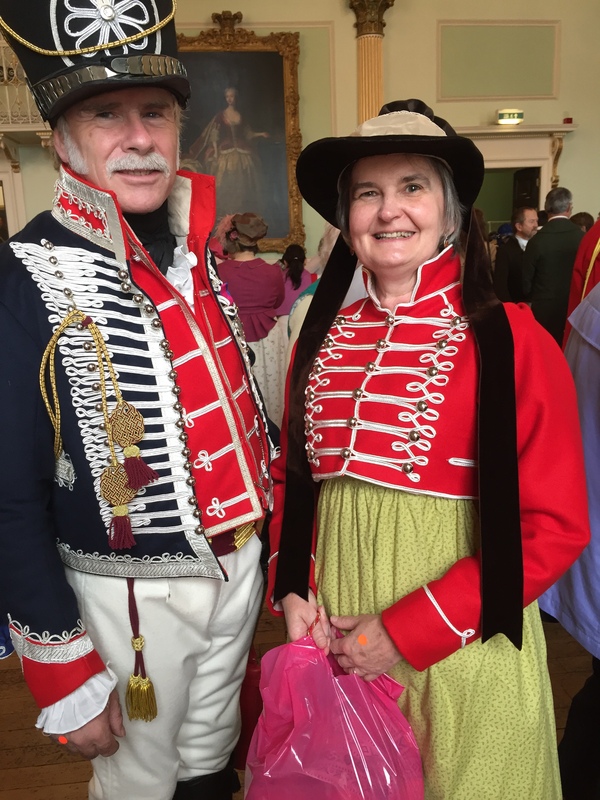 My Customers were sporting their Prior Attire bling – Janet picked up two new hats from me, and it was the first outing of the military style spencer… David’s finery was made a year ago – more on its making here. 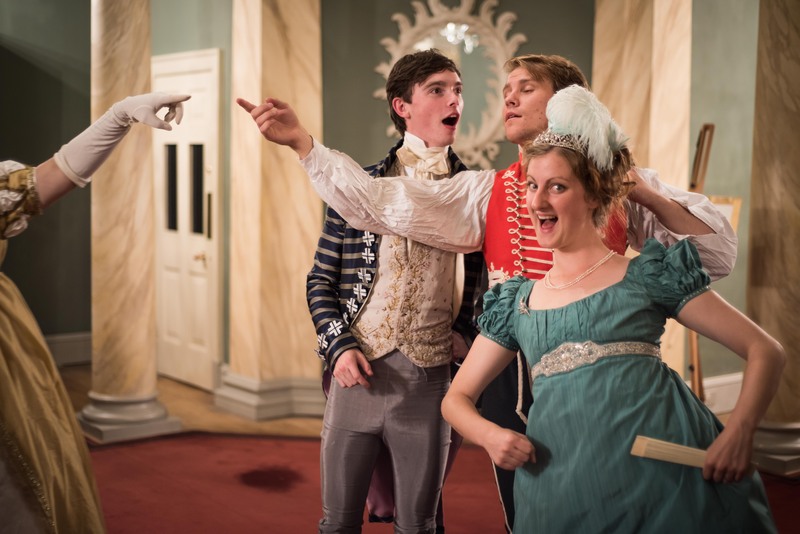 And so, off to the ball we went – armed with a big camera too! 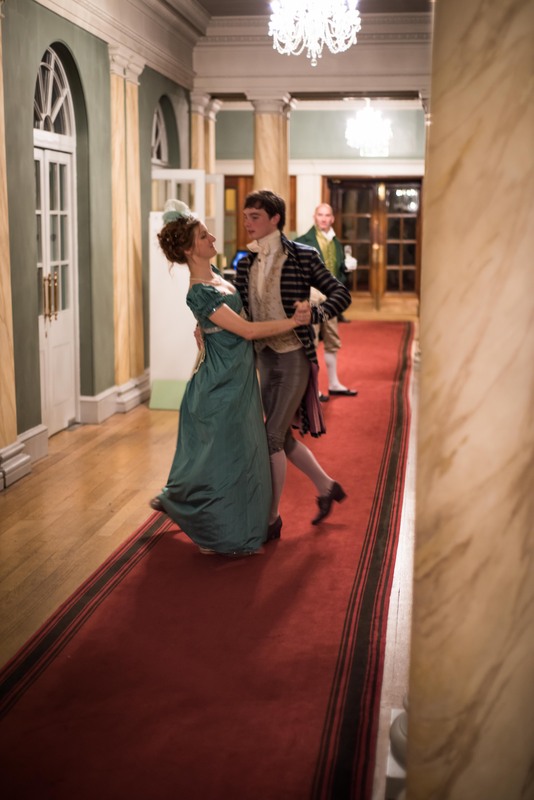 We had an amazing time, despite being so tired (I danced every other dance to conserve my energy), and the meal was superb… pictures below! 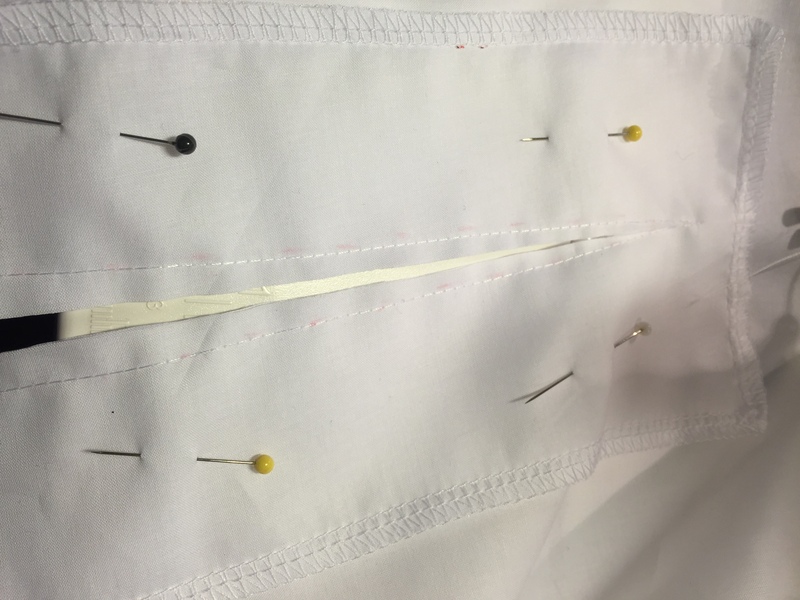 Zack from Pinsent Tailoring, in the tightest breaches ever – check out his work, very good! 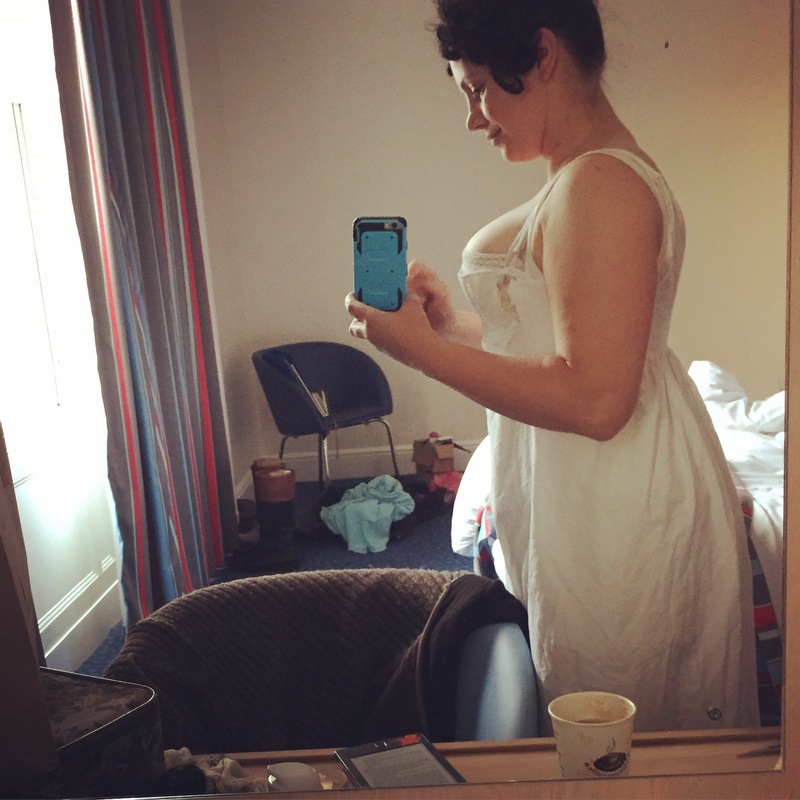 A tiny bit too big, otherwse I think I would be keeping it to myself! 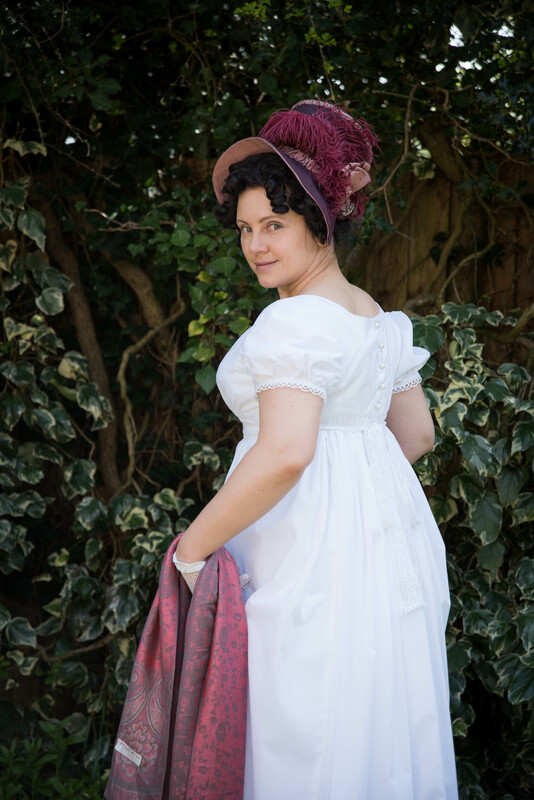 We even made a short video about how to put on a regency brassiere: – enjoy! 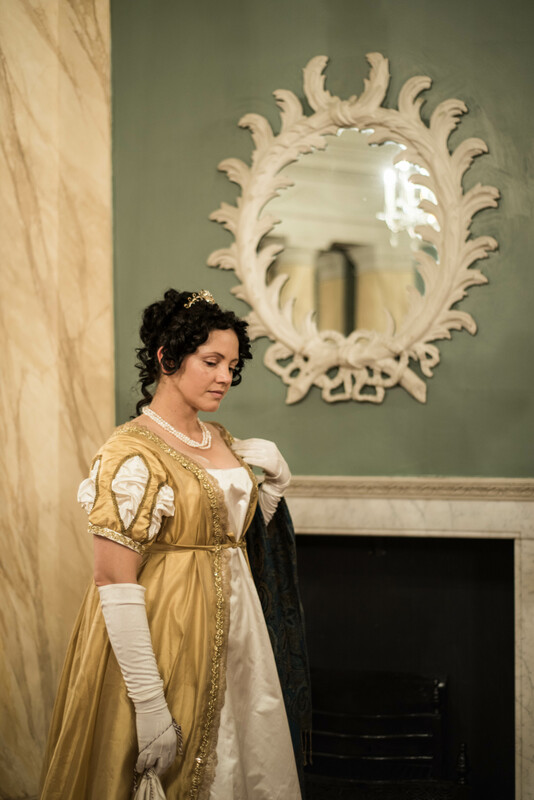 Many thanks to PItcheresque Imagery for the photos! Well, that was something different. 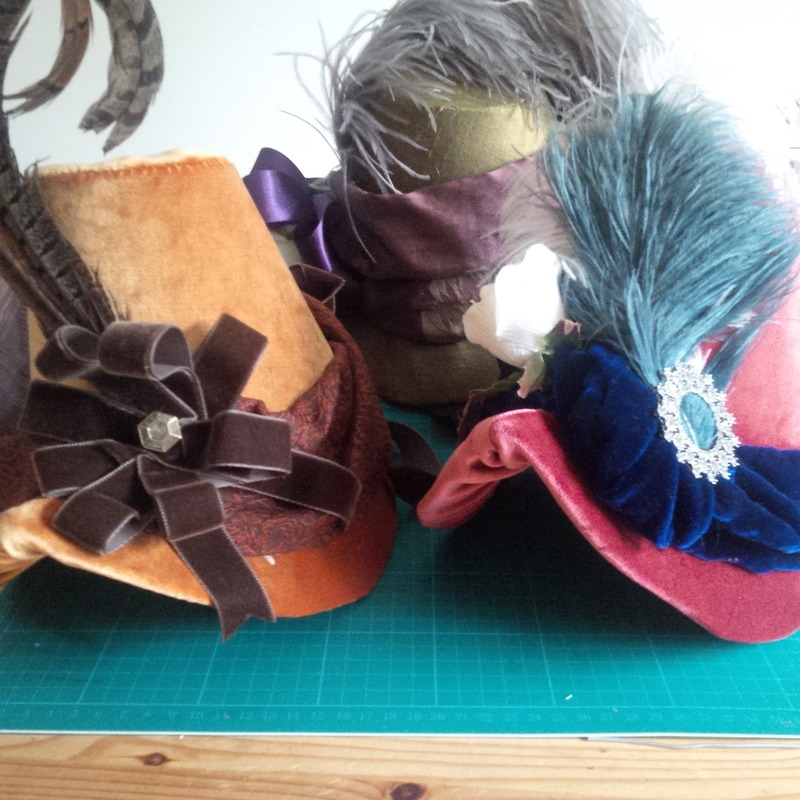 One week I have an idea, next week the outfit is ready…. 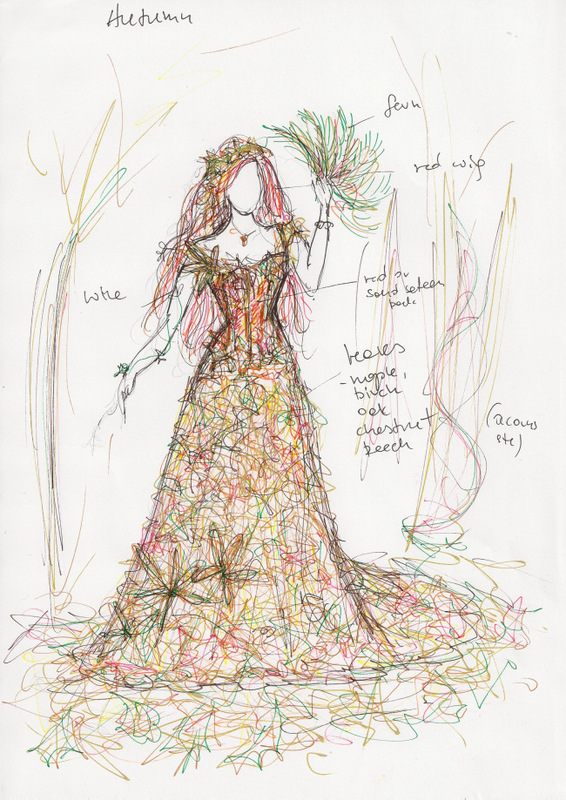 absolutely loving the result of the friendly/professional cooperation on this project – it looks like the other seasons will be represented by organic, ephemeral dresses as well. This will be a little bit different from my usual posts, and possibly a little controversial, but I feel some things simply have to be said. Running a business has its ups and downs, pros and cons, its challenges and its rewards. I love running mine – and the only thing that sometimes makes me pause is the interaction with some of my potential clients. Usually online, sometimes at trading events. I feel I have been very lucky in general, and my customers are at least 90% lovely people (I became friends with many of them), but over the years there have been enough of the less-than-perfect kind to make up that the 10%. To be honest, in most cases people simply behave in a particular way because they are oblivious to certain facts about the way of that life people in my line of work lead. They simply do not realize how rude they can sound – I believe if they did, they would be mortified! True, some people are dicks and nothing can change that, but most of them are simply unaware that their behaviour can cause offence. This is not simply my own opinion – quite a few folks running small craft & art related businesses have experienced similar treatment, and probably for the same reason; I suppose that other small business may have been on the receiving end, too. Below I am going to list the most common ‘faux pas‘ that I have personally come across. Usually small things, but small things do accumulate and can lead to a very negative client experience. And, hopefully, small things are also easy to amend. Some of the interactions mentioned may only be perceived as less than pleasant from my personal perspective – as a very happy introvert I tend to have a very specific perception I suppose – things that make me want to turn around and run away may make another costumer jump for joy, for example – but I think some of the situations are relevant no matter what your personal traits may be. 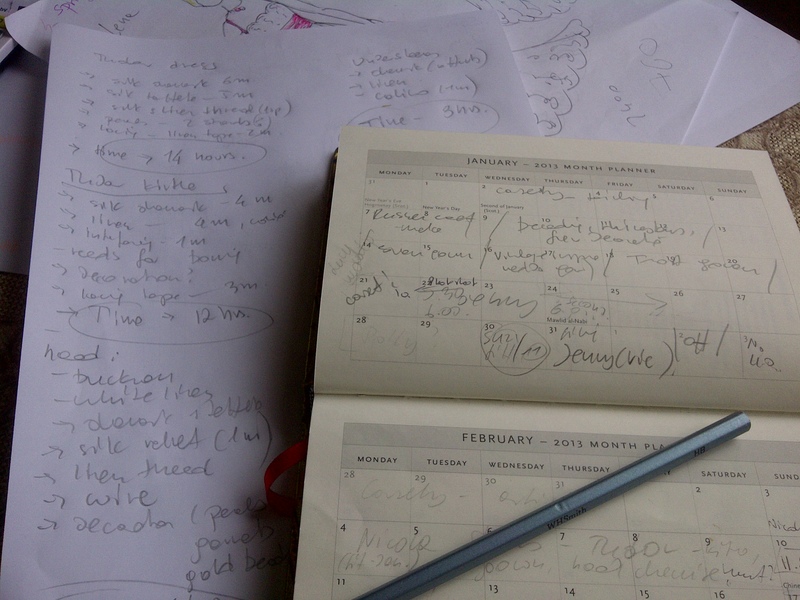 So without further ado, this is my private list of ‘issues’ – and how they may be avoided! *Remember that written word can come across much more harshly than when spoken. *I understand that nowadays formality tends to be often forgotten, but please when writing to me try to address me by my proper name, and not diminutives or ‘ huni’, ‘sweetie’ etc. This is a personal pet hate – I understand that some people just use endearments automatically, but neither my family, my friends nor even my husband call me ‘sweetie’ . For a complete stranger, in a strictly professional situation, it is simply off-putting, at least for me. My name is Izabela – please use it and we will all be happy. 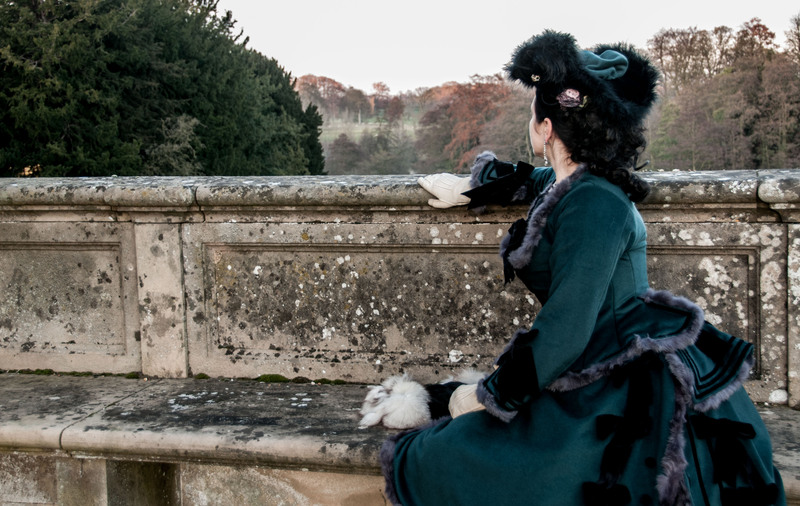 *Please do not ask me to copy the work of another designer; especially if you want it at a fraction of the original price, (more on the cost of bespoke, art items and pricing in the industry can be read about in the this post – A Queen on a Budget, please.) Also, do not be offended if I cannot take your order because it is something that we do not make – in such cases I will attempt to provide links to other people who specialise in that area, (shoes, fantasy and fancy-dress costume, etc), I simply know my limits and if I decline to accept an order, it is for a good reason. 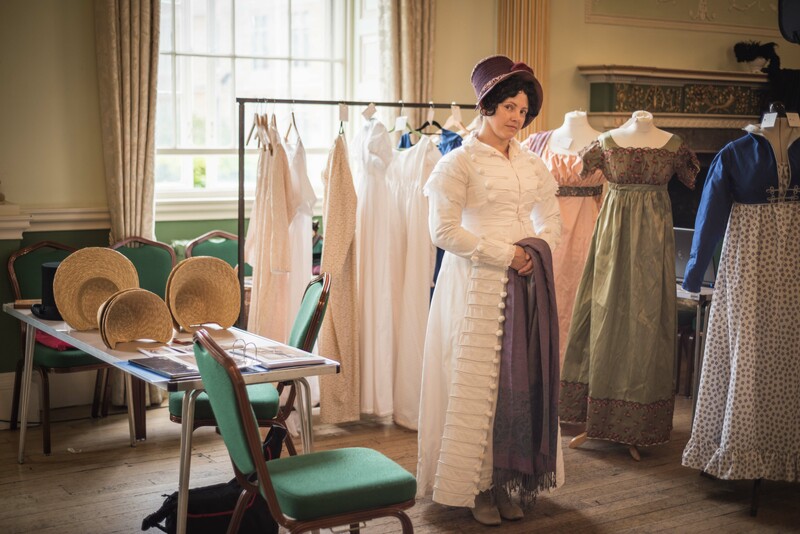 We specialise in historically accurate clothing – if you need a fancy-dress Victorian costume with medieval sleeves and Regency silhouette, in lycra, we may not be the best choice – but we probably know people who can make it for you, so we will endeavour to provide you with an alternative solution if we can! *Book well ahead – I tend to be booked up to 6 months or more in advance. 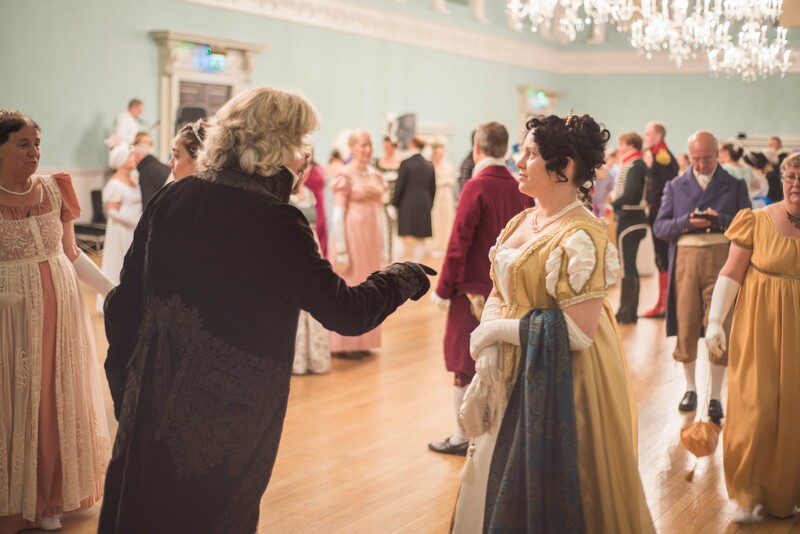 Yes, I can sometimes have an emergency slot available, but often I simply cannot provide you with a full Regency finery for ‘next week’ – it is nothing personal, there are simply not enough hours in the day for me to do the work – especially since those rare emergency slots are already digging into my personal time and rest. *Be prepared to sign a contract and don’t be offended when we ask for a deposit; It is simply a part of running a business in a proper and effective manner, and avoiding running at a loss. More on running a business here – and even more, especially on contracts, here. *Do not be offended if I do not accept your friend request on Facebook. I may be old fashioned, but I keep my personal account for family and friends – which means people I have met, interacted with, liked, and deal in person often. Having an item made does not make you a friend – yet. Over the time if we meet often enough and find we like each other that may change, (and often does), but since we are starting from a professional footing, simply keep in touch through my page until such a time comes when we may change the status quo. 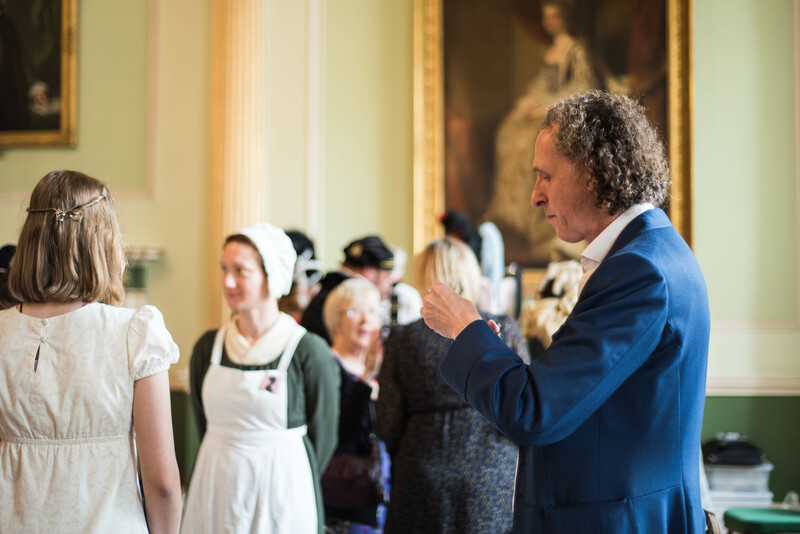 *also – I do not offer a free advise/tuition/consultation service via fb or email. We do provide the service if needs be, but it is a hourly paid job. At the moment, if I was to answer every message/ email asking me for advice, opinion, etc i would probably not have time to do anything at all – we get about 10-120 on avarage. Per day. So nothing personal, but I cannot help you unless you book us in advance for a specific thing, billable by the hour… and the fact that you masquarade your request for help/ free advice its by putting a few sentences about how much you admire my work, does not really change it. Sorry! my Youtube channel visitors… 80% of your messages and questions is answered in the credits of the video. Watch them, please, before asking. I am happy to answer more in depth/ interesting questions, but if you wish to know where I get the cotumes from (sic!) or my shoes from, all the information, with the liks is in the credits at the end. Also, google…..
*Do tell me how many people are coming along – unless otherwise specified I expect only you. I need to know if there are more people as there are problems of space as well my personal issues. To me, the sudden invasion of 5 people when I was expecting 1 is just like a punch to the face. Suddenly instead of the controlled, serene environment I am used to working in, the situation is changed into chaos, when everybody is everywhere, all talking very politely no doubt, but nevertheless very distracting. 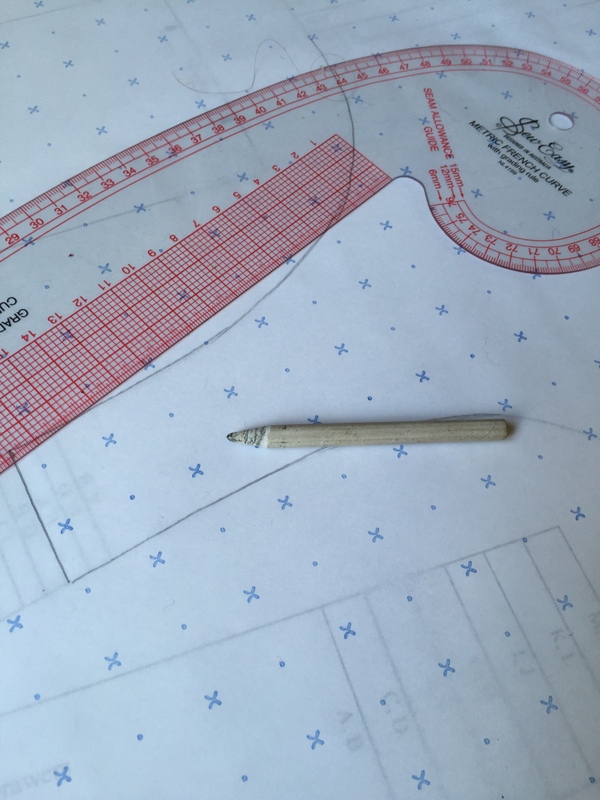 I do need to concentrate when I am fitting toiles, taking measurements and discussing designs with the client. Loud chatter, however amicable, is not helping. *Ditto children – my studio is not at all child friendly – there are lots of sharp objects around, lots of antique stuff, expensive silks- so unless you can keep your offspring under control (which means another person to do so while you are busy working with me), preserving any Health and Safety rules will cetainly be tricky – in which case I would have to decline the commission. Please let me know beforehand so that we can come up with appropriate solution to the situation. *Do not ‘pop by’ without an appointment. Not only may I not be in, but I may be busy, either working on urgent stuff or working with another customer, (who may be in a state of dishabille), so I would have to turn you away from the door. Again, nothing personal, but it may feel like rejection, so please always ask when is a good time if you need to see me in person. *Try not to be late. I usually have 2, 3 appointments on any fitting day, usually, for efficiency’s sake, one after another. If you arrive late, it may impact on another appointment, so please call to let me know if you are running late. If you want me to put aside a whole day, or afternoon just for you, that is fine – but my time comes at a cost. You don’t pop round to your lawyer, doctor or dentist more or less at the time that suits you, so please extend me the same courtesy; working from home doesn’t mean that I am any less busy! * don’t expect me to work on holidays/ weekends. I often do, and I do suggest weekends to my customers who cannot make it otherwise, but please remember, that our line of work means we are usually away at the weekend. So if your contract says that the fittings will take place, as agreed, in the beginning of a month, please make sure you are available. 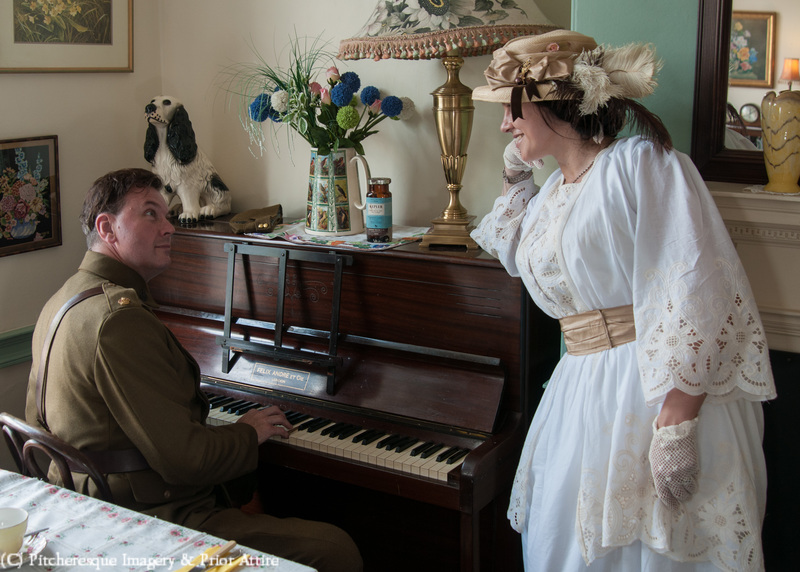 We can adapt – but all summer we are away weekends, working at events, so if you forget to book a day off it may be another month or more before we have a weekend at home! please understand that we usually cannot come over to you for fittings. Unless previously agreed on and arranged it is smply not possible as I will need to carry my tools with me ( and believe me, the machiness are not light) and there will be additional charge for travel cost and time used. Don’t be offended when I cannot offer you your drink of choice or other refreshments. Being a small studio room, it has basic facilities – there is a a look and a tiny kitchenette where I keep stuff i use for myself – fruit teas, coffee etc. I don’t use milk or sugar, I don’t keep biscuits around – so i wont be able to offer anything else I already have. 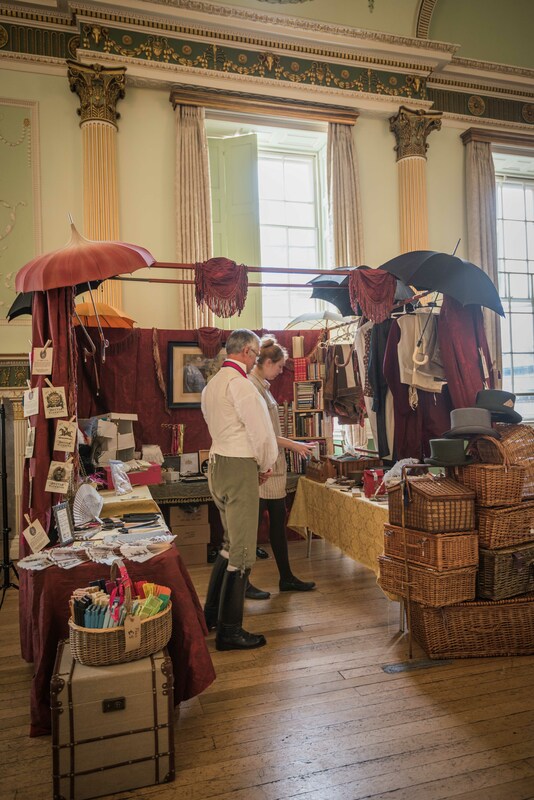 Talking of lunch – please, let the stall holders have their lunch in peace! Trying to answer your questions with a mouth full of bagel is not a nice experience for anyone! We usually have one of us or a helper to front the shop when one person is eating – but people still manage to dodge them and sneak in at the back of the stall to talk to the person who is currently enjoying their lunch. *Do not ask me to work for free. 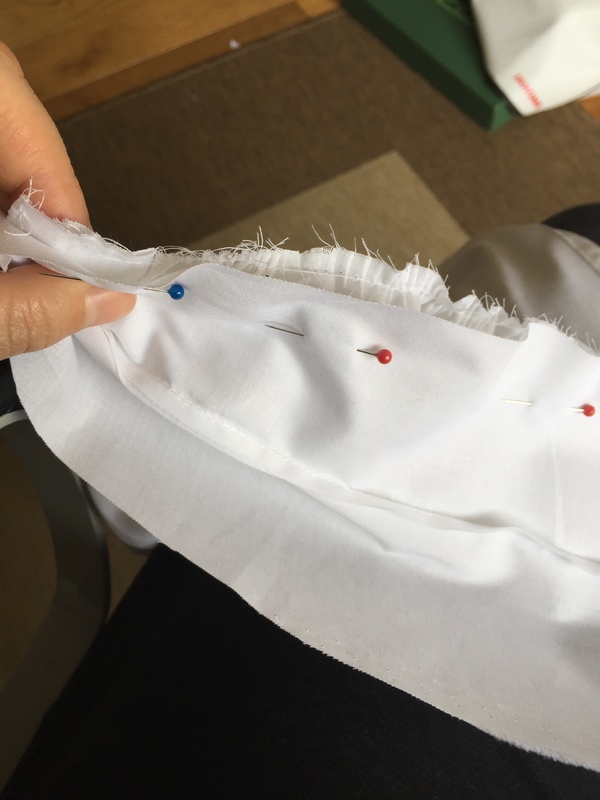 Whatever tips and advice on costuming I can give I will, and a great deal of information is on the blog here anyway, but do not ask me to provide an ad hoc workshop/lecture for your benefit, for free. This happens quite a lot – a recent one was in Bath, during the market there; let me quote it for you..
Yeah, actually, we make stuff like that ourselves, for us and sometimes for sale, and we tried these styles before and they didn’t really work well, so we are just trying to work out the construction details – could you please explain to us how you put these together? Oh and these ones too? (at that point one of them took a notebook and a pencil out). I looked at her and asked – ‘What do you do for a living madam? ‘Why, I teach the flute’. ‘Could you please explain to me how you play the flute? Could you teach me now, just the basics? She looked at me, completely taken aback. ‘Why, well, I could, but I charge for my lessons! My response? ‘So do I’…. She actually saw the point and was rather embarrassed, and apologized, but it sort of sums up the fact that a lot of people do not take what I do for a living seriously and assume it is ‘just ‘ a hobby – I suppose other people running craft or art based businesses are often faced by a similar situation. *Another point – you don’t generally go to let’s say, a baker, or a carpenter, have a look around, finger the goods, sneer and announce that you can do it better than they, and/or possibly cheaper. So please refrain from doing it to stallholders at the markets. Even if you indeed, can make the items better and at a lesser cost. Just incredibly rude. *please ask before touching the clothing. And make sure your children are under control – especially if they are eating at the time – we did have a few mishaps involving children, dogs, icecream or a burger…. And finally, some interactions from the online shop. * am interested in the blue dress, but it is not my size, can you re-model it so that is 3 sizes bigger? 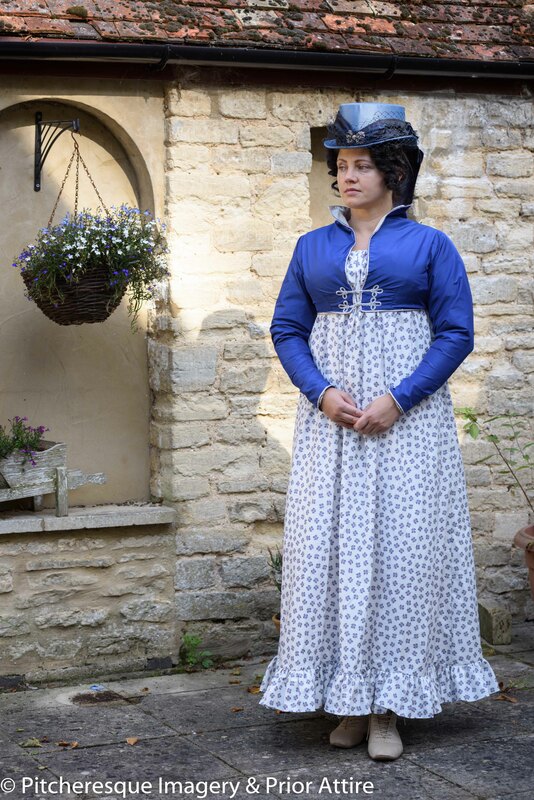 * am interested in the blue riding habit, I clicked on the link but it takes me to the shop based in the UK. Can you please post the link to your USA branch? Otherwise I would be unable to purchase as shipping and customs duty are expensive. * am interested in the grey skirt, i clicked on the link to the shop but it gives price in pounds. Why is there no Euro? I don’t like working out the conversion rates myself. * are the measurements American? How many centimeters in an inch? 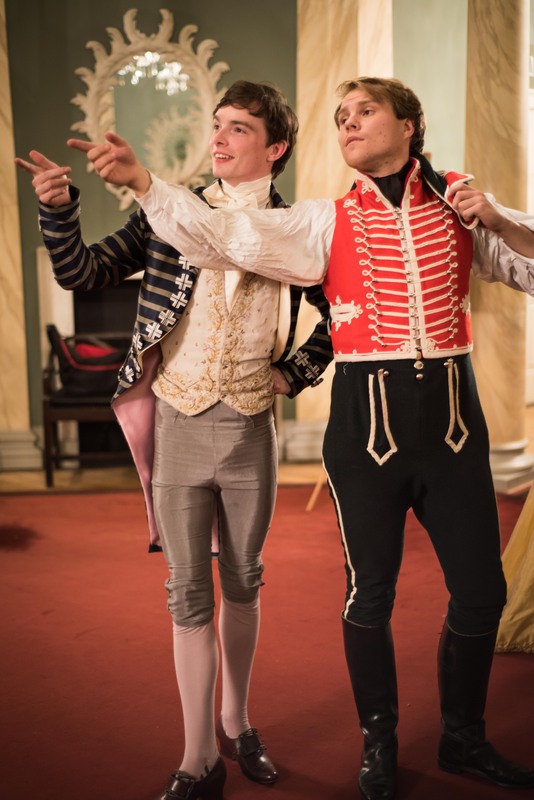 * I like your corsets! 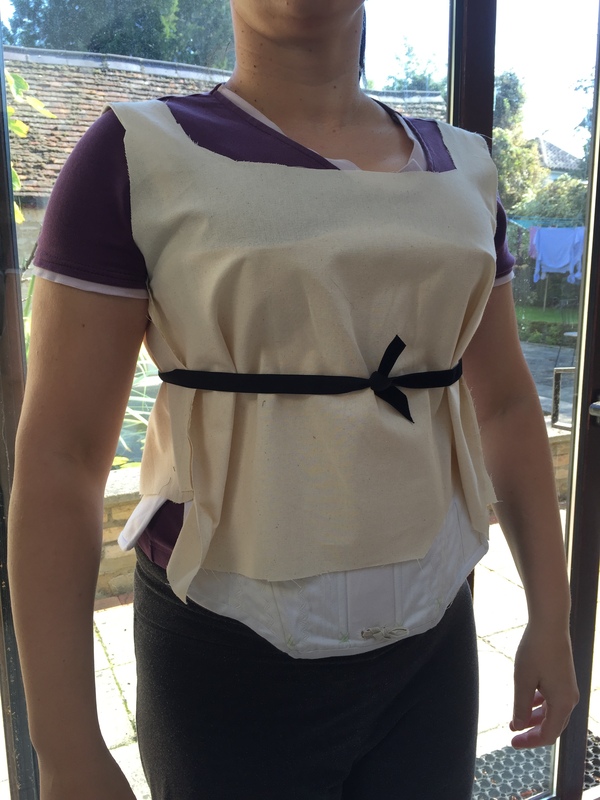 I want one but in different colour, and in my size – can you make me one for this Saturday? Would the price be the same? 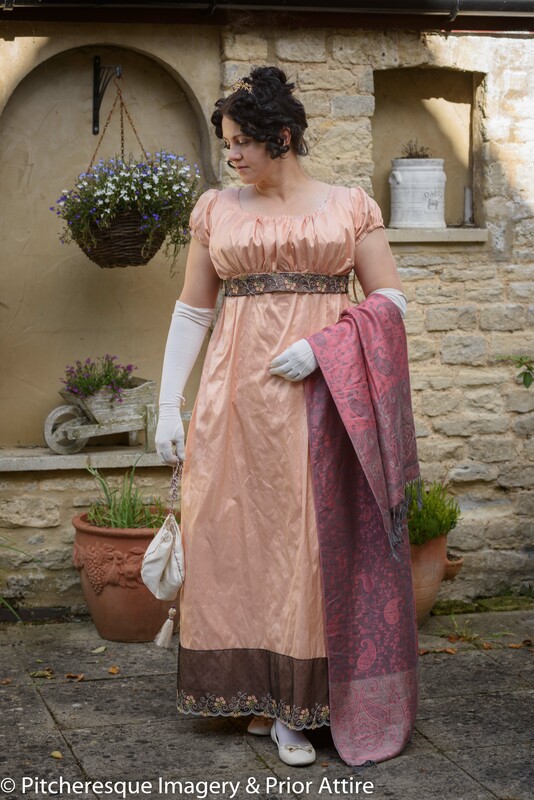 * I love the pink Victorian gown in silk, but is too expensive! 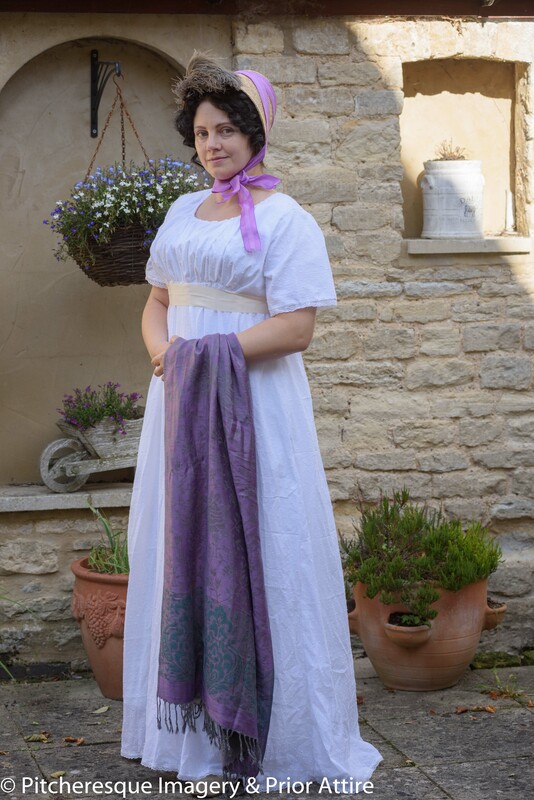 I can spend max £150 on a thing like that, would you consider selling it for £150 (postage included), or making me a bespoke one for that price? 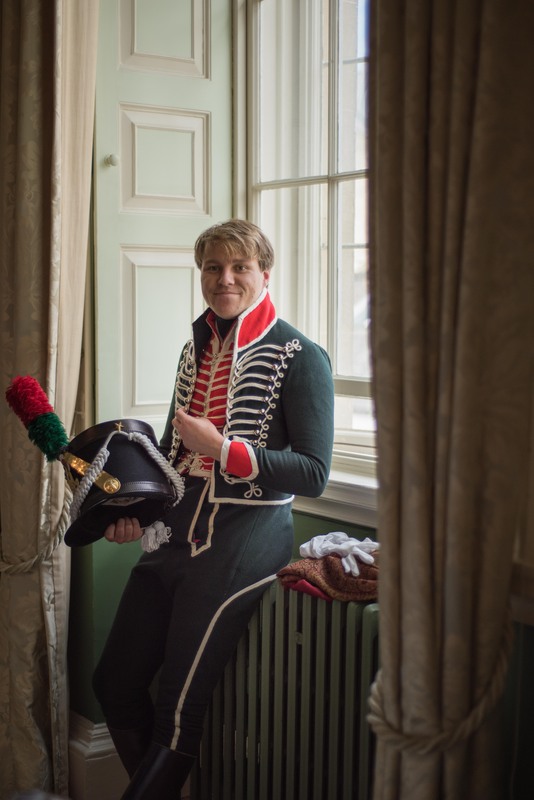 * the riding habits are lovely, but why are there only 2 available? and why not in a range of sizes, and colours? 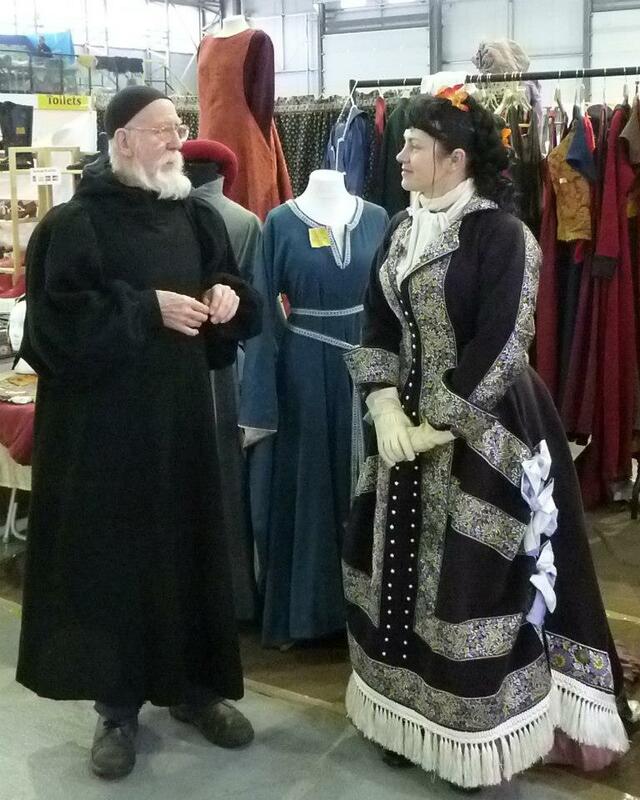 * am interested in the medieval Burgundian gown, but can purchase it in July only – can you keep it for me? I am not saying I will buy it, just considering and would like to know it is still available in July. 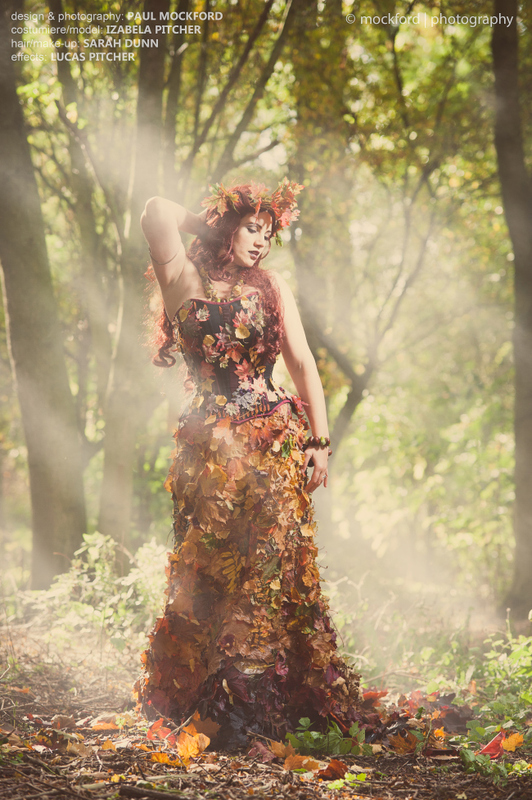 * I want a bespoke one, when are you able to make me one? (my answer – am now booked till October) – whaaaatttt!!!! October??? this is ridiculous, I need one for June! how can you run a business like that! Can you not shift other people so that mine can be made first? Here I feel the very fact that we have an online shop may be put to blame – people simply assume that we are a much bigger business than we are – and flattering as that may be, it often causes awkward situations. Also, people assume that our ideology is the same as that of big chain stores and find it difficult to understand that we do not carry a huge stock of the same items in a range of colours and sizes. Our field is quite narrow, and I like to think that I specialise in unique and individual items – so our stock items, though usually in ‘generic’ sizes are still unique. 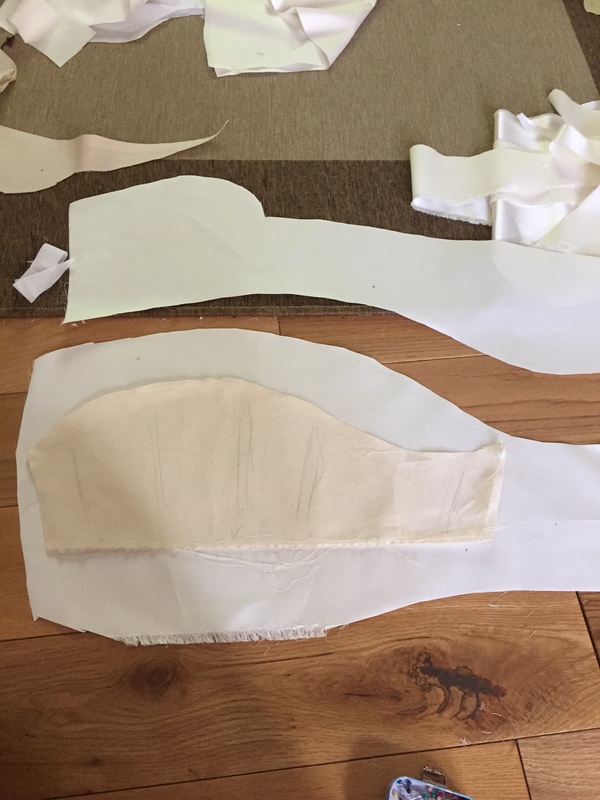 I have no desire to create the same dress in 6 different sizes and 3 different colours – this would not only kill the joy of making an individual item to me, but poses a question of stock control, space, cost, etc. We are a small business, and I have no particular desire to grow into a huge one. Might happen – might not. 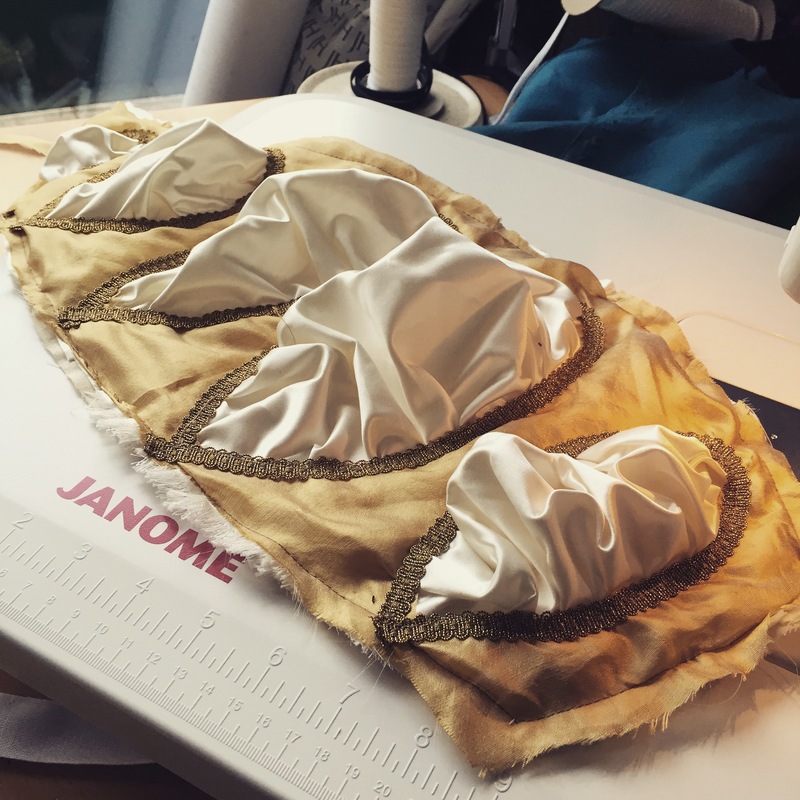 At the moment I take pleasure in making items unique – even our stock corsets have individual touches that make them unique. 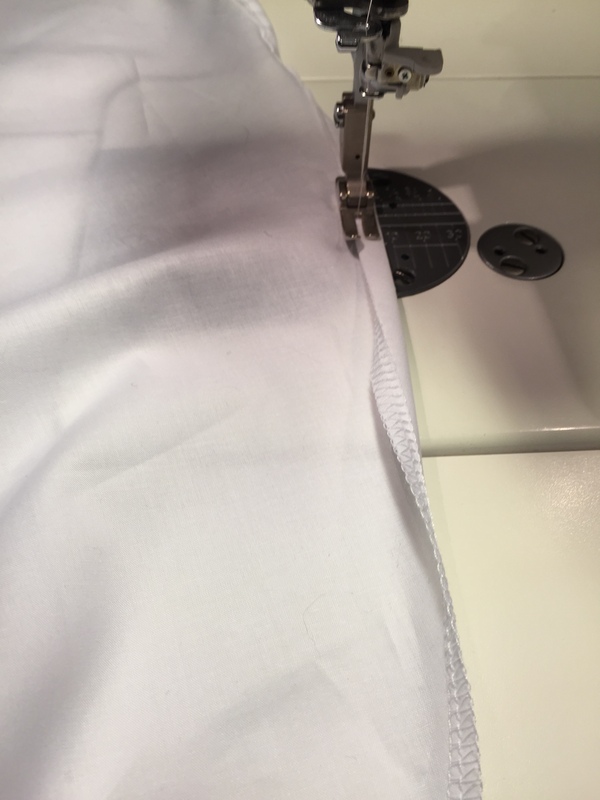 Nowadays, many people are motivated by finance alone – and whereas, as a business you have to be, to some extent, I am in the happy situation where I can make what I want to make and enjoy it – and I treasure the enjoyment coming from creating one specific item much higher than profits coming from mass producing shirts. And as for being booked well ahead – well, we often are booked for more than 6 months in advance. Asking me to move other clients around so that your stuff can be made earlier is not only disrespectful to me but to other clients as well – imagine that it is the the other folks who are asking me to shift you around…. just not professional. 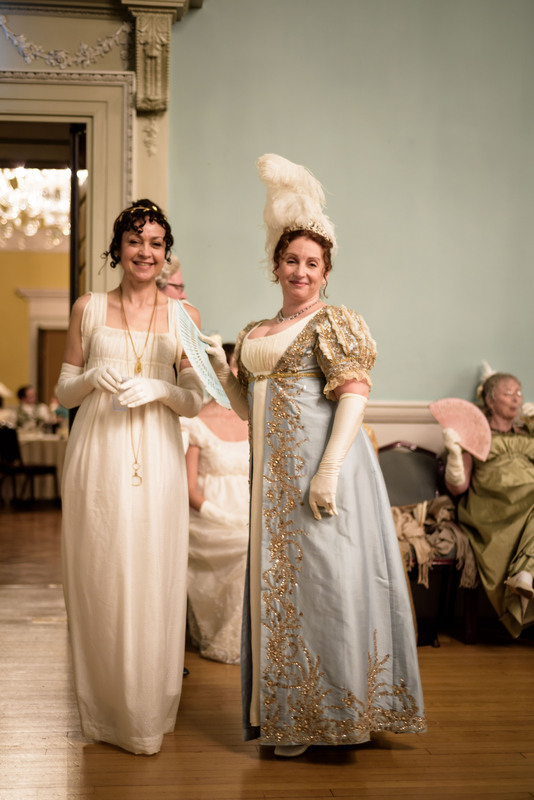 And it doesn’t mater if you are a Russian princess, a celebrity, local theater, or an individual – once the contract is signed, your order is treated in exactly the same way as everybody else’s. Full equality. Well, that’s about it, I think – a bit of a rant, maybe, but as I have said, a lot of the problems stems from misunderstanding of the industry, and not malice. I do not wish to offend anyone and I think there are few people who go out of their way to offend others, especially if they want to develop a professional relationship, so I think maybe this post help both parts to understand each other a bit better. 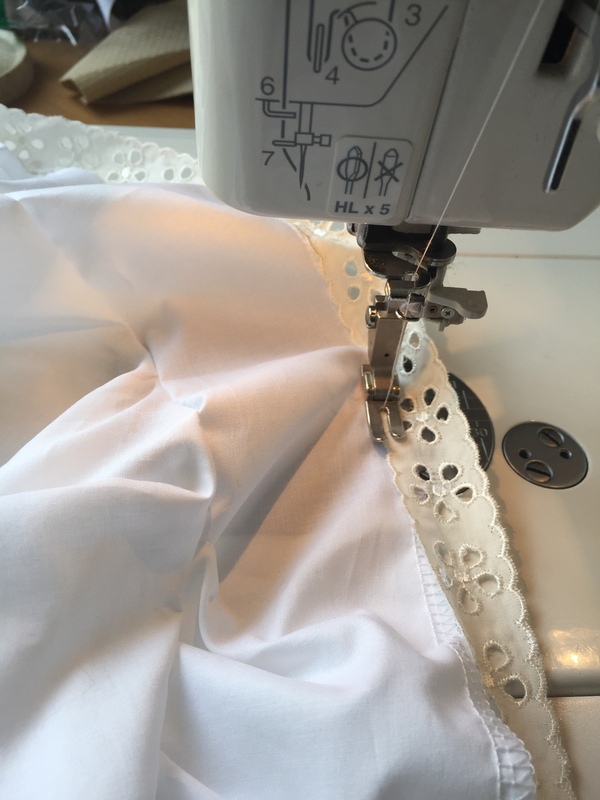 And if you run a home/craft based business and you have experiences similar situations, or have something to add – please comment!